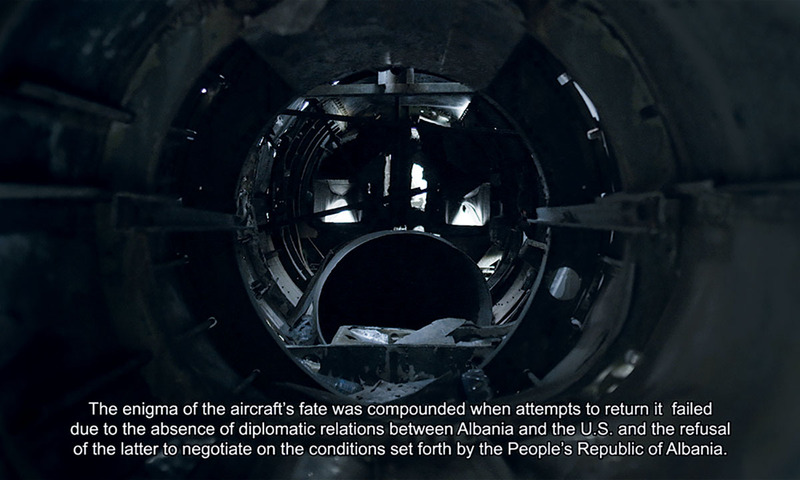 Albanian Trilogy: A Series of Devious Stratagems, a project by Armando Lulaj curated by Marco Scotini, is a reflection on Albanian social history, a single narrative corpus articulated over three distinct moments: Albanian Trilogy is a sort of time capsule of the past, with strange memorabilia and trophies which presents, contemporaneously, fiction and documentary material. 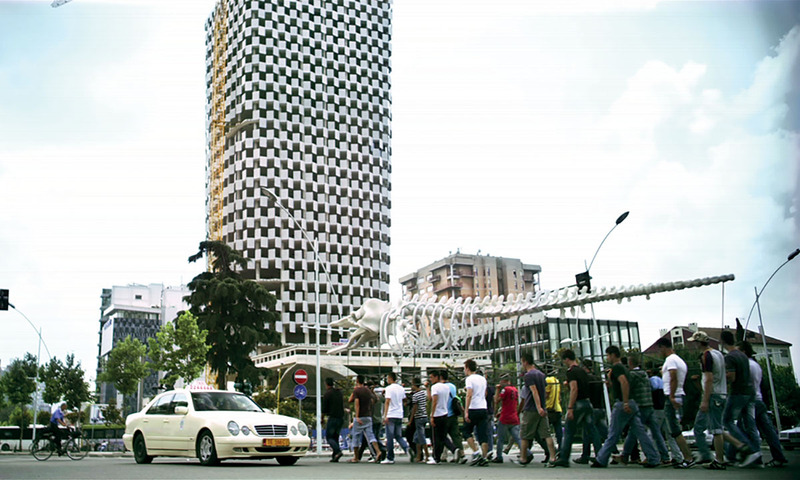 Combining evocation and documentation, the project concentrates on a historic-political phase that was extremely important for the building of an identity that was not just Albanian but international. 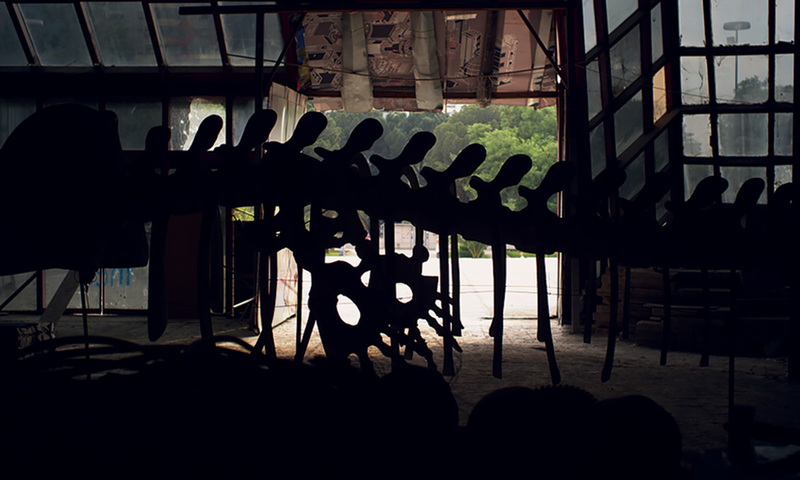 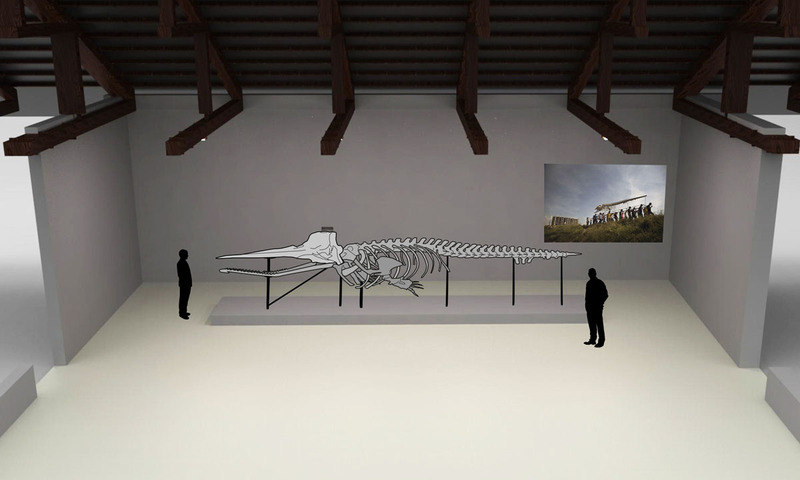 On display are three videos and archival materials, as well as an enormous whale’s skeleton, which is both protagonist and silent witness—an incarnation of the giant-Leviathan, the Hobbesian principle of sovereignty. 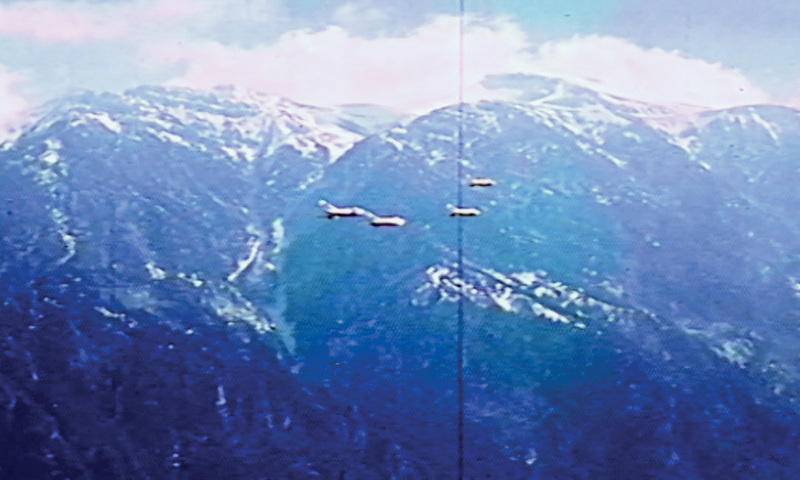 For Armando Lulaj (Tirana, 1980) Albanian Trilogy represents the conclusion of many years of research into the period of the Cold War in Albania and, in particular, on the relative themes of collective memory and historic experience, brought together in a film trilogy - in which three mythical fetishes symbolize sea, air and land. 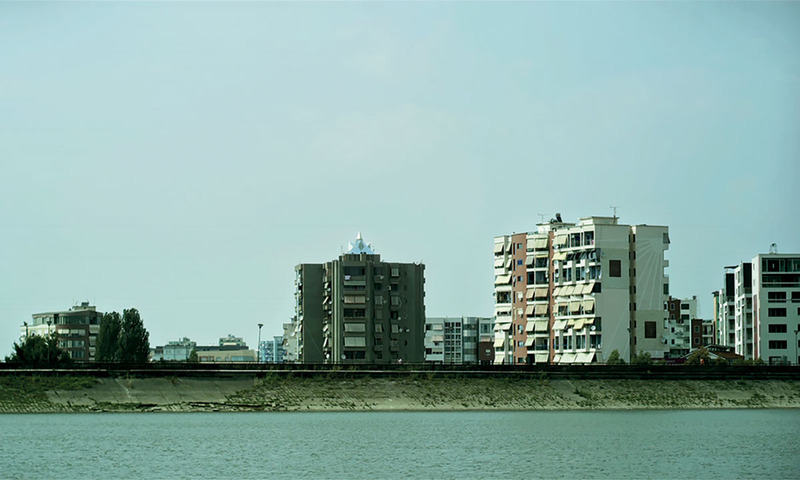 The first work in this series is It Wears as It Grows (2011), the second piece of the trilogy is the well-known project NEVER (2012), while the third video Recapitulation (2015) was created specifically for the 2015 Venice Biennial. 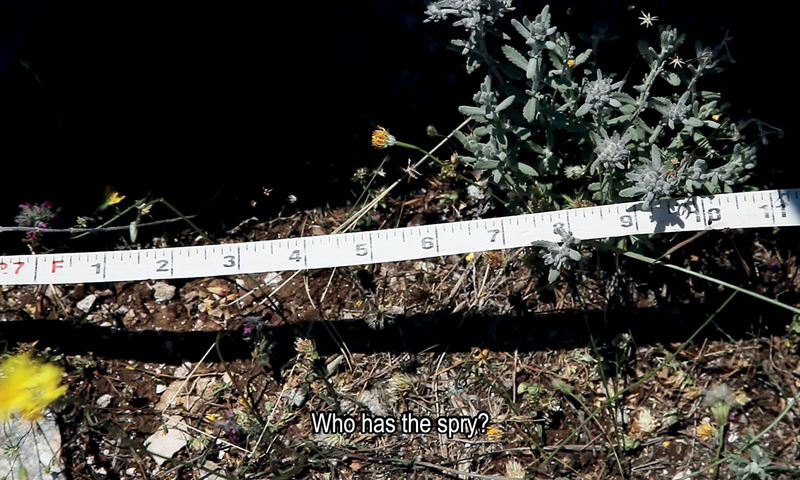 Lulaj’s work plays, above all, on the lapses in history: as the curator, Marco Scotini, states: “it reveals a friable terrain where one expects to find potent and unmovable representations”. 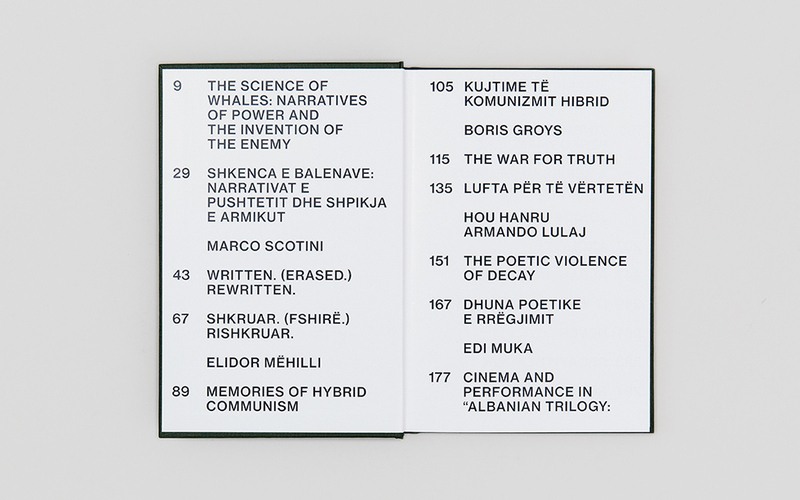 In Albanian Trilogy, Lulaj’s artistic research into the specters of socialism and Scotini’s curatorial research on the politics of memory arrive at an important common result. 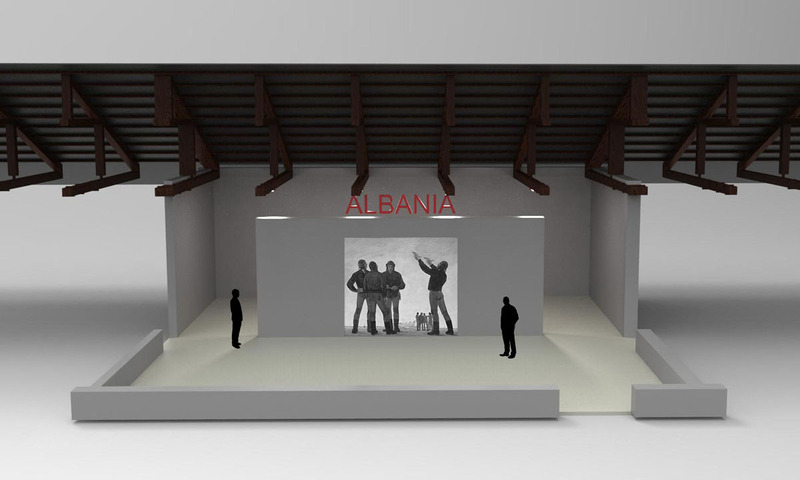 The Albanian Pavilion is commissioned by the Ministry of Culture of the Republic of Albania and supported by Servizi Italia Spa, Paolo Maria Deanesi Gallery and Galleria Artra. 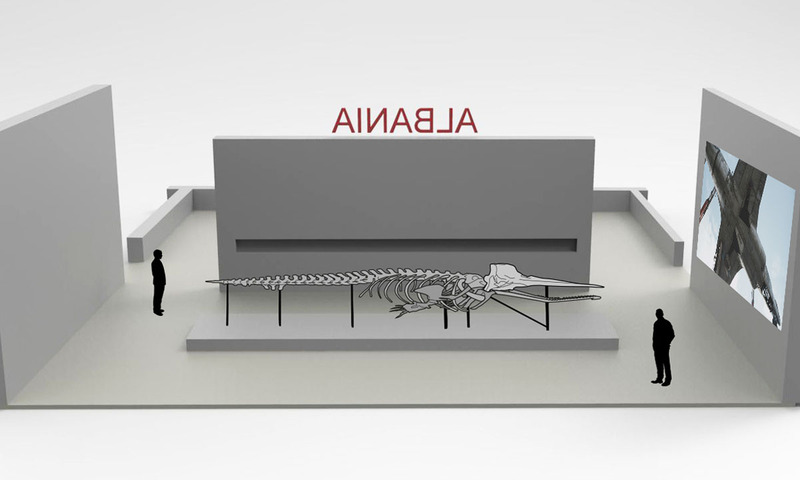 Thanks are extended to the following for their collaboration: Central State Archive of Albania and the Museum of Natural Sciences in Tirana. 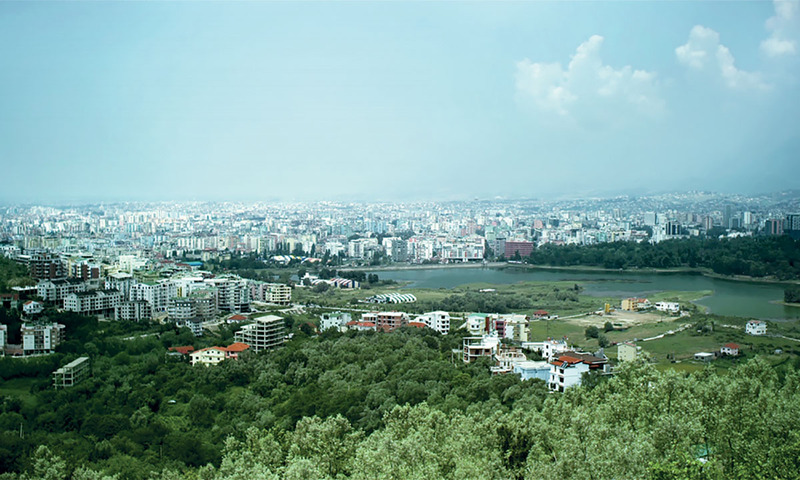 Born in 1980, Armando Lulaj is an artist, playwright, and filmmaker living and working in Tirana, Albania. 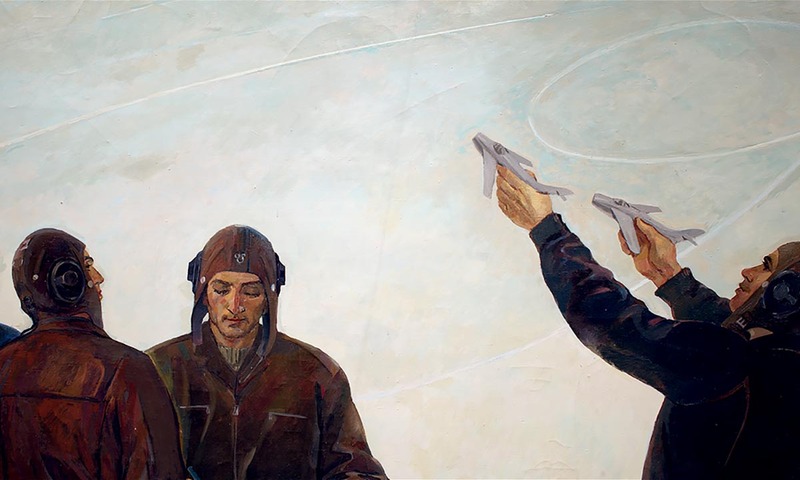 After studies in Florence and Bologna, he graduated with an MFA at the Academy of Fine Arts in Bologna in 2011. 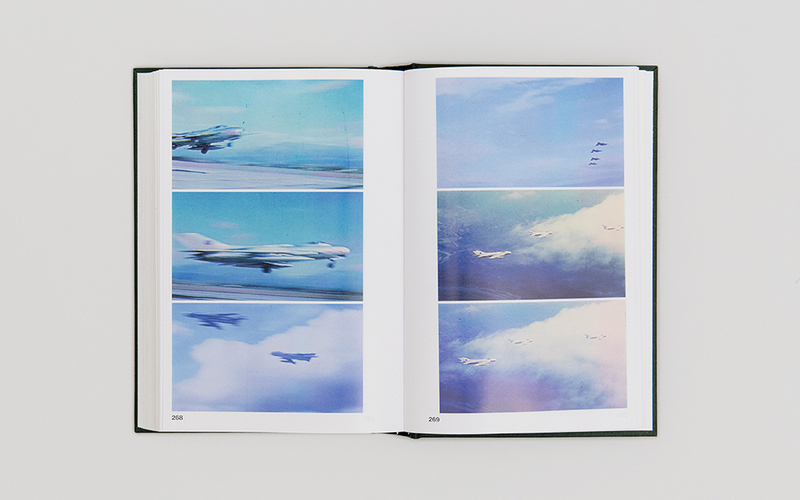 His solo shows include UNTITLED (Bologna: Galleria Cavour, 2014); Fiend (Tirana: National Theatre, 2013); Cold Wind (Bologna: Art Fair, 2013; Basel: Volta8, 2012); No More Feelings (Rovereto: Paolo Maria Deanesi Gallery, 2012); No Mercy (Milan: Artra Gallery, 2011); Silent Soziale Corruption (Munich: Stästische Kunsthalle München, 2010); Time Out of Joint (New Zealand: Te Tuhi Center for the Arts, 2007); Mainstream Dissent (Milan: Artra Gallery, 2006); Temporary Autonomous Zones (Tirana: Insurgent Space, 2005), and he participated in international group shows in Albania, Austria, Czech Republic, France, Germany, Greece, Guatemala, Italy, Kosovo, Mexico, Poland, Serbia, South Korea, Sweden, Switzerland, and Turkey. 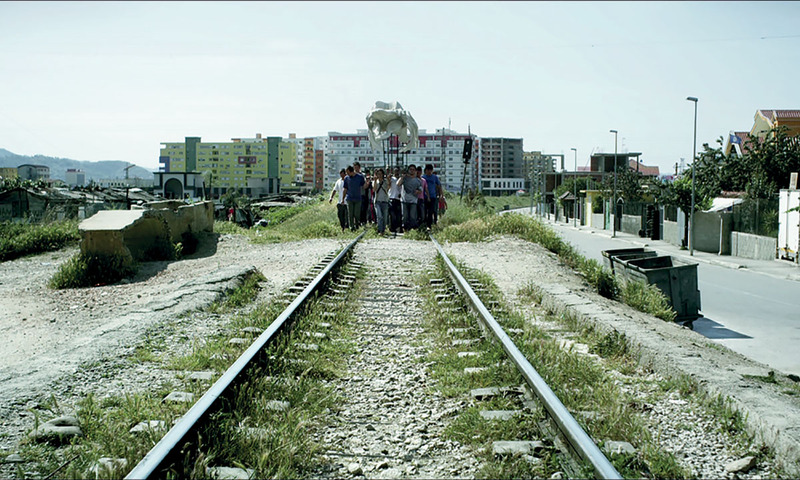 Short films include NEVER (2012); It Wears As It Grows (2011); Problems with Relationship (2005); Living in Memory (2004), and screenplays 100 Euro (2012); Firefly (2011); The Tristidia Rhapsody (2010). 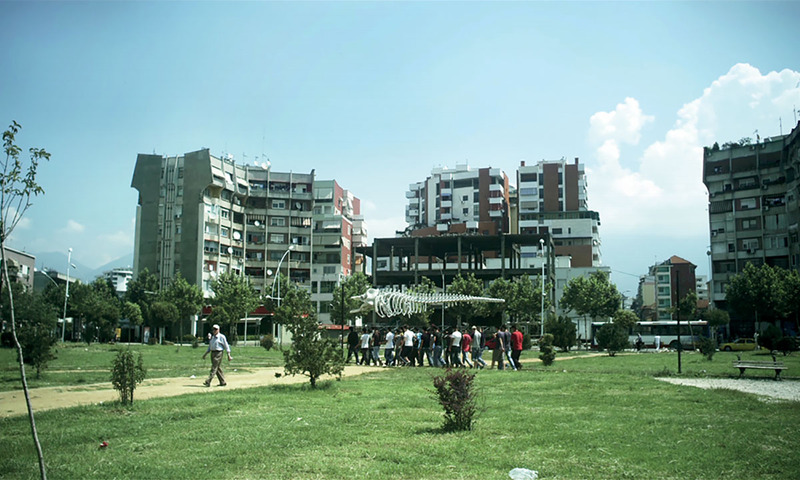 Lulaj has been an artist in residence at <rotor> (Graz, 2014), TICA – AIRLAB (Tirana, 2012) IASPIS (Stockholm, 2010); Villa Valberta (Munich, 2009); Action Field Kodra (Thessaloniki, 2006). 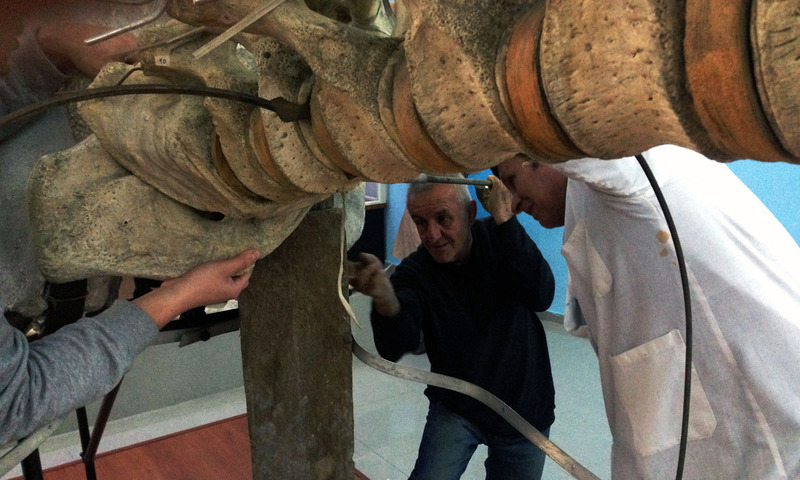 His work has been awarded first prizes at the Marco Magnani Prize, 2011; Premio Paolo Parati, 2011; Premio Carmen Silvestroni 2008; Onufri Prize 2006. 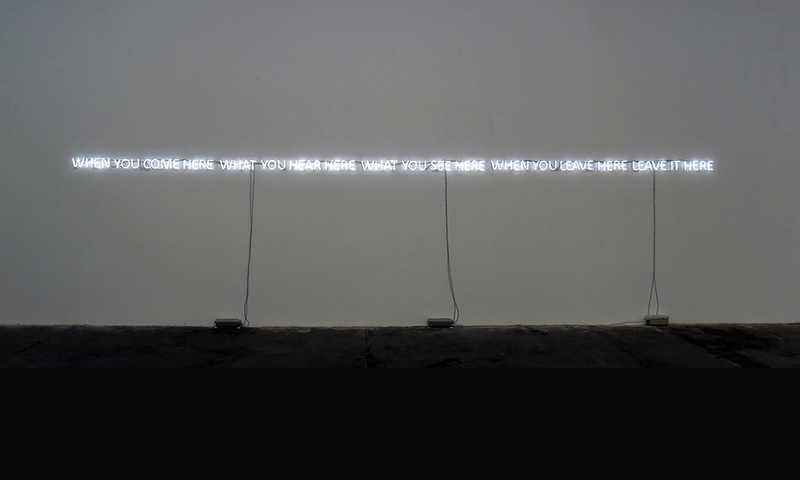 Independent curator and art critic based in Milan. 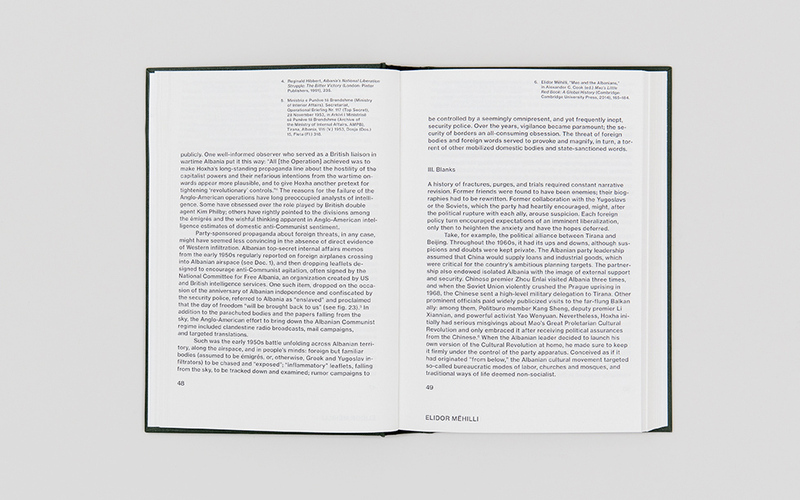 He is the Director of the department of Visual Arts and Curatorial Studies at NABA in Milan, Editor-in-Chief of the magazine No Order: Art in a Post-Fordist Society (Archive Books, Berlin), Director of the Gianni Colombo Archive (Milan), Artistic Director of the PAV and Curator of Piero Gilardi Foundation in Turin. 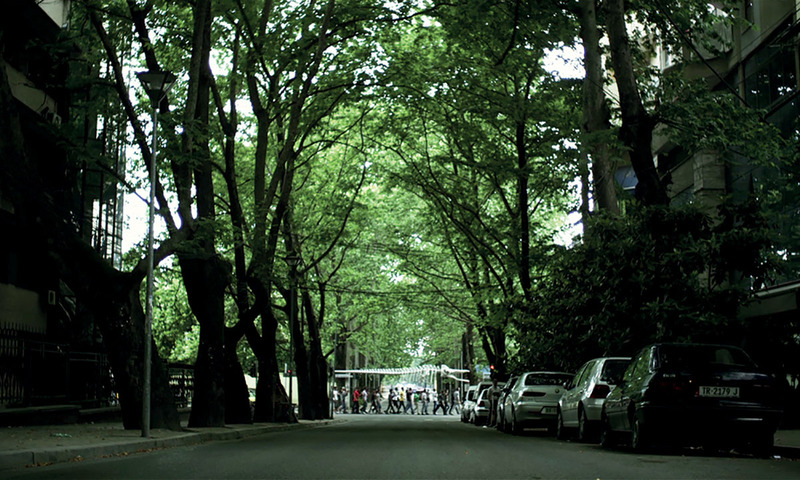 He is one of the founding members of Isola Art and Community Center in Milan. 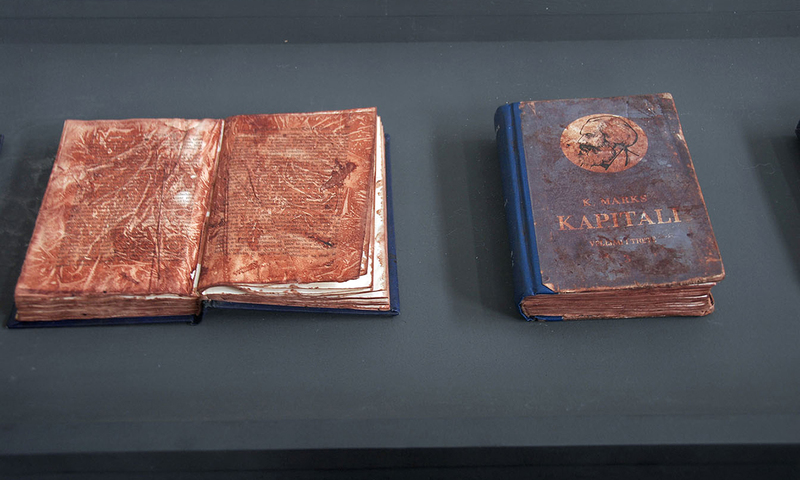 His writings can be found in periodicals such as Moscow Art Magazine, Springerin, Flash Art, Domus, Manifesta Journal, Kaleidoscope, Brumaria, Chto Delat?/What is to be done?, Open!, South as a State of Mind, and Alfabeta. 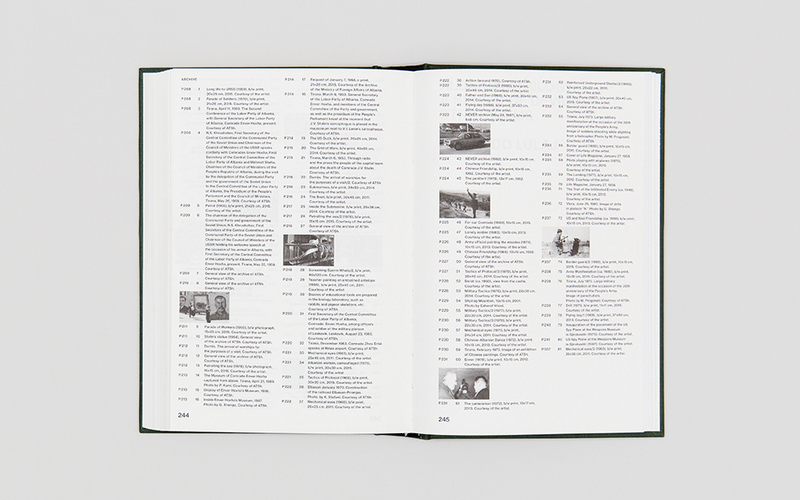 He is the editor of a book dedicated to film documentary and archive, Politics of Memory (Rome: DeriveApprodi, 2014; Berlin: Archive Books, 2015) with contributions by John Akomfrah, Eric Baudelaire, Ursula Biemann, Yervant Gianikian e Angela Ricci Lucchi, Khaled Jarrar, Lamia Joreige, Gintaras Makarevicius, Angela Melitopoulos, Deimantas Narkevicius, Lisl Ponger, Florian Schneider, Eyal Sivan, Hito Steyerl, Jean-Marie Teno, Trinh T. Minh-ha, Wendelien van Oldenborgh, Clemens von Wedemeyer, Mohanad Yaqubi. 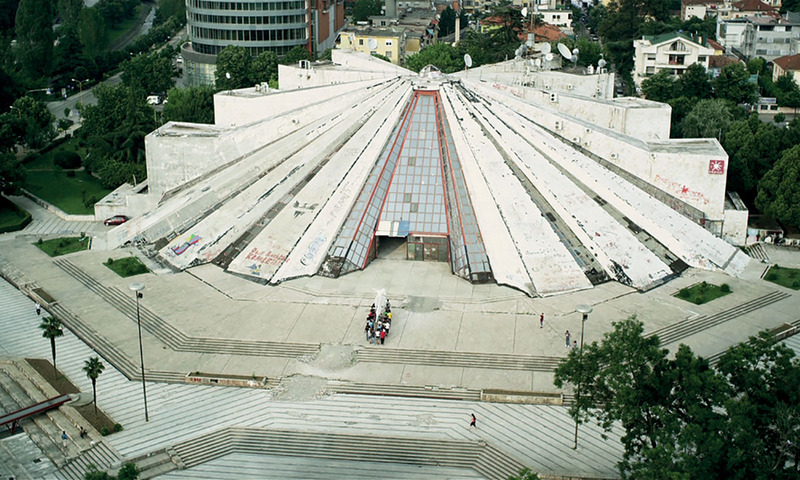 His most recent exhibitions include the ongoing project Disobedience Archive (Berlin, Mexico DF, Eindhoven, Karlsruhe, Nottingham, Bucharest, Riga, Zagreb, Atlanta, Boston, Umea, Copenhagen, Turin, Madrid, Istanbul 2005–2014); Da Capo: Deimantas Narkevicius (Zagreb: MSU, 2015); Too early Too late. 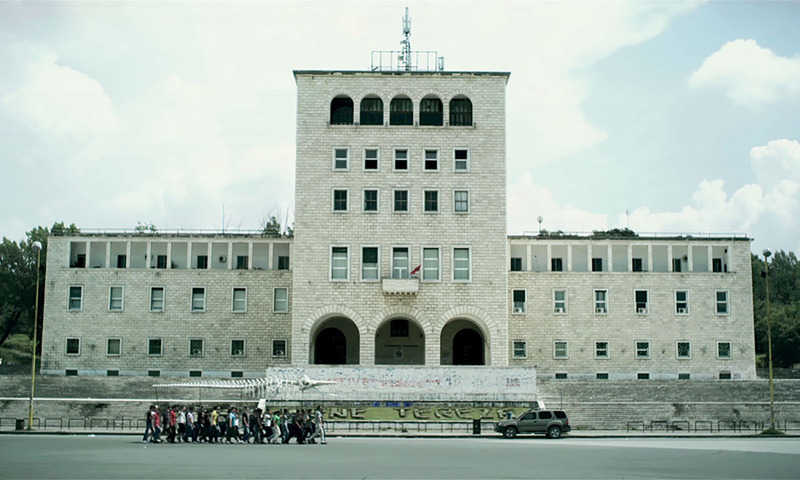 Middle-East and Modernity (Bologna: Pinacoteca Nazionale, 2015); Vegetation as a Political Agent (Turin: PAV, 2014); The Empty Pedestal: Ghosts from Eastern Europe (Bologna: Archeological Museum, 2014); A History of Irritated Material (London: Raven Row, 2010) co-curated with Lars Bang Larsen and Gianni Colombo (Turin: Castello di Rivoli, 2009), co-curated with Carolyn Christov-Bakargiev. 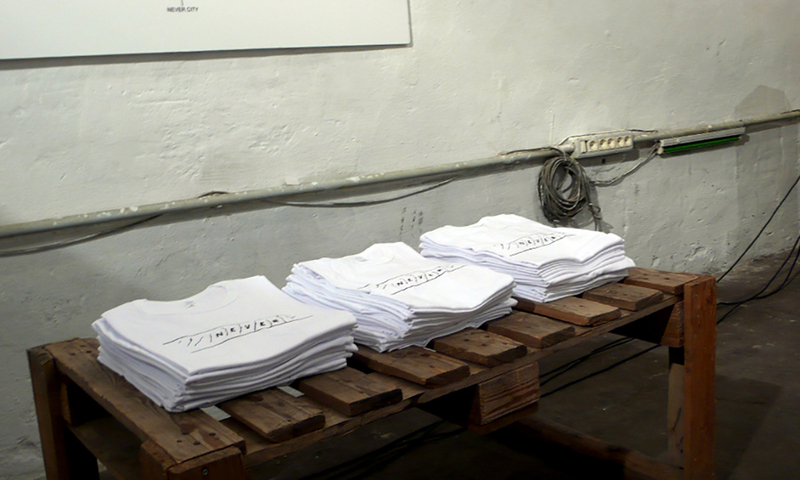 He has also dedicated numerous exhibitions to the artistic scene from Eastern Europe, including: A Sense of Wellbeing: Loss, History and Desires (Karlovy Vary: Palace of the Imperial Thermal Baths, 2001); Revolutions Reloaded (with Mihnea Mircan, Berlin & Milan, 2003–2004) Der Prozess: Collective Memory and Social History (Prague Biennale 3, 2007); October: Exit, Memory and Desire (with Andris Brinkmanis, Milan, 2007). 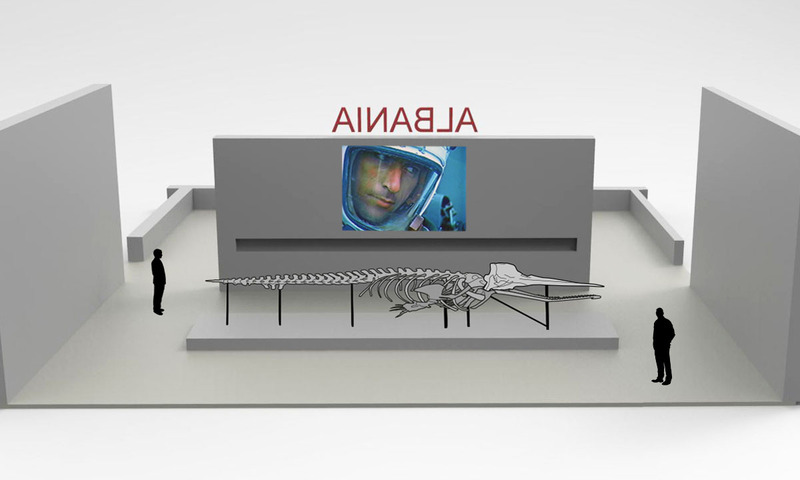 His collaboration with Armando Lulaj lasts since 2001 and he has supported and collaborated with the artist ever since. 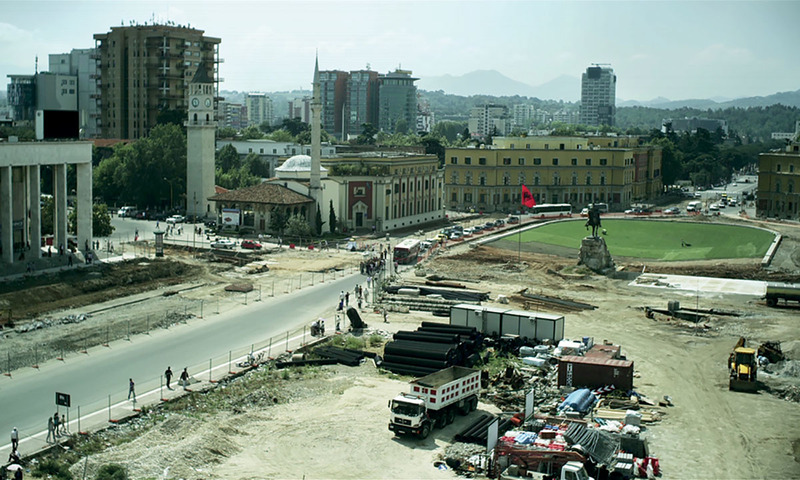 The main exhibited work at the Albanian Pavilion is a trilogy of films on which Armando Lulaj has been working for several years and which he will complete for the 2015 Venice Biennal. 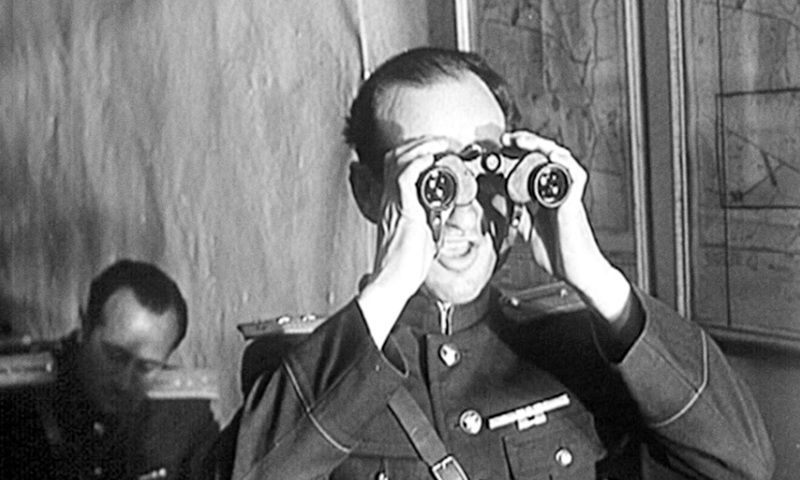 The consistent theme that underlies each of the three films is a hidden sign, an inconspicuous emblem of the socialist past that rebels against official collocations and returns to visibility in the present as something entirely different. 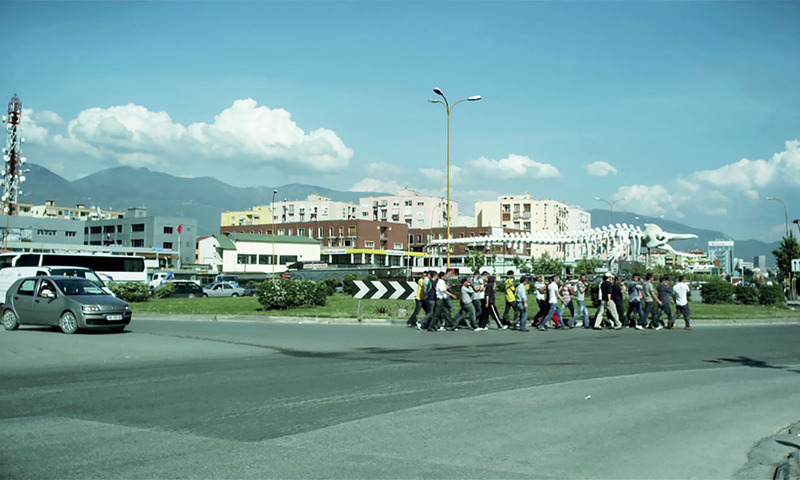 Albanian Trilogy: A Series of Devious Stratagems aims to identify the forces of power with those of natural phenomena and to unmask the processes which govern social memory. 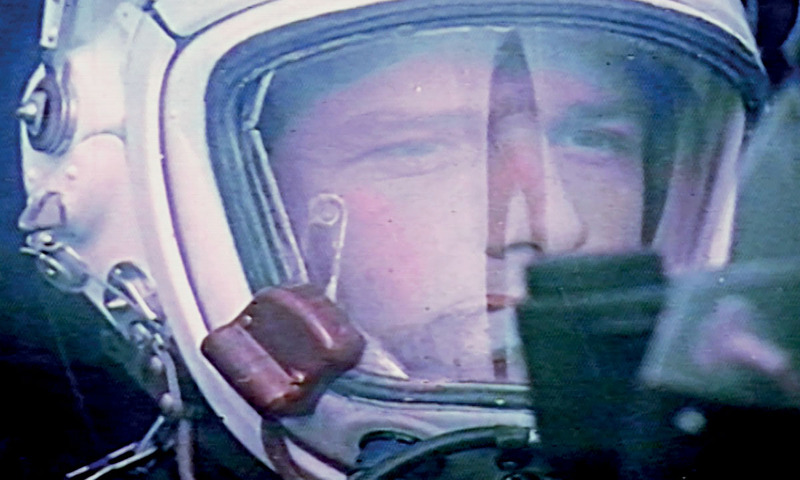 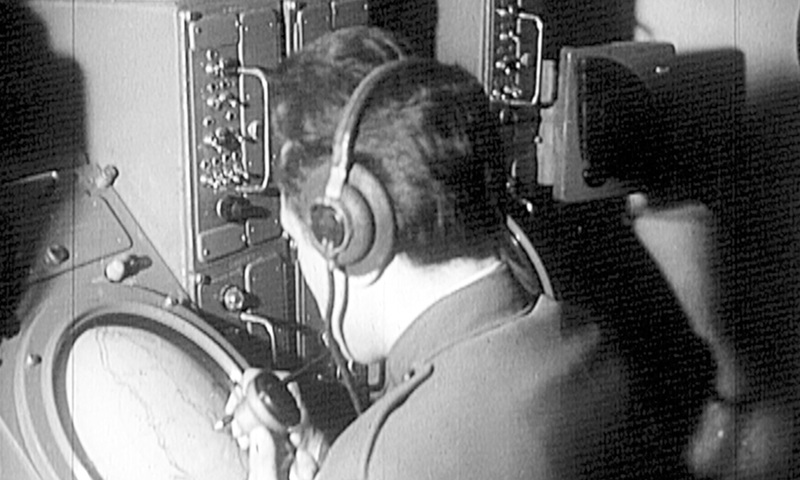 A submarine incident between political adversaries in 1963, the inscription of a political message from 1968 on the earth’s crust and, again, the capture of an enemy plane in 1957 become, respectively, the starting point of each of the three films. 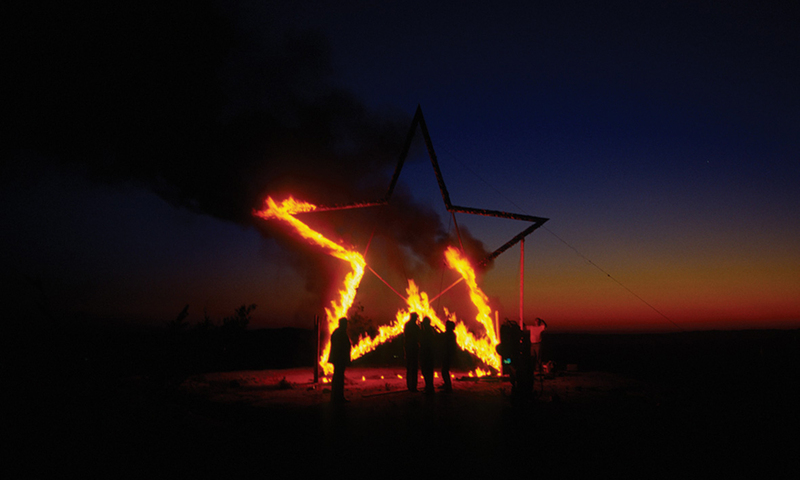 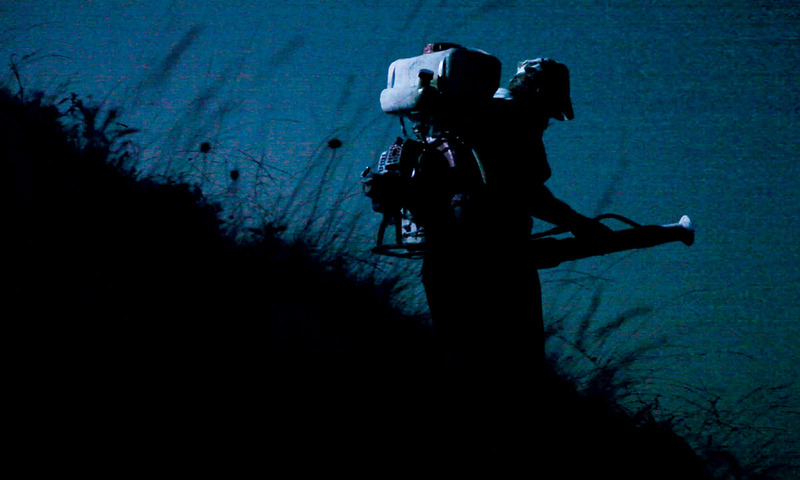 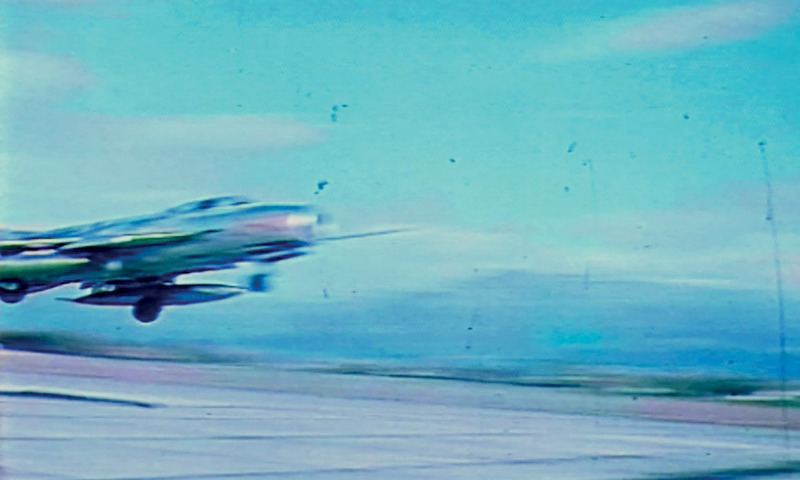 At the same time, however, these episodes also represent the escape point of each film: through a series of actions devised by the artist, each sign of the past is diverted into the emblematic image of something else (local signs that are now profiled within an international perspective). 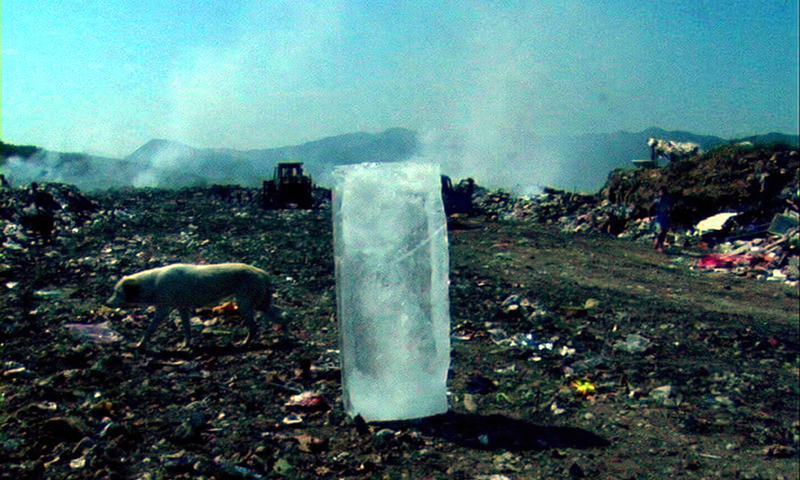 The actions which, in each film, Lulaj sets out, never return to the past but begin there to push themselves forward, raising doubts and uncertainty about the present. 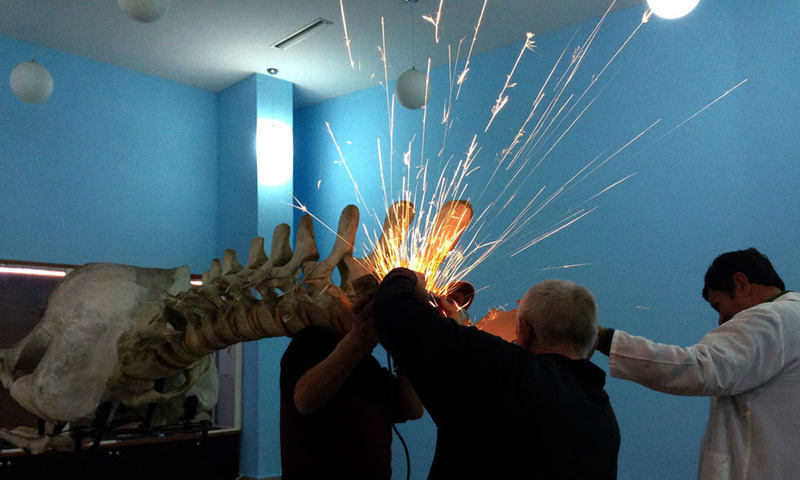 The operation of de-archiving becomes inseparable from the power of imagination. 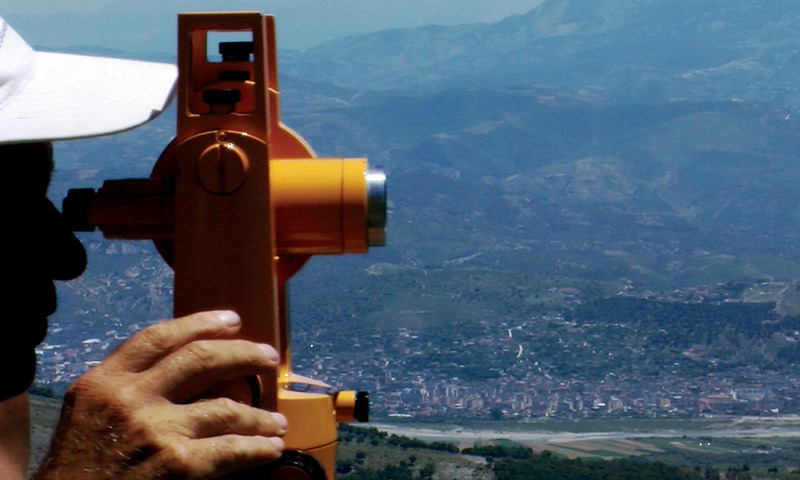 On May 25, 1959, at the height of the Cold War, Nikita Khrushchev visited Albania to discuss the Soviet Union’s plans to arm Enver Hoxha's state with submarines and warships, positioning long and medium-range missiles along the Albanian coast, in order to counter the U.S. missile bases installed in Italy for the sake of controlling the Mediterranean. 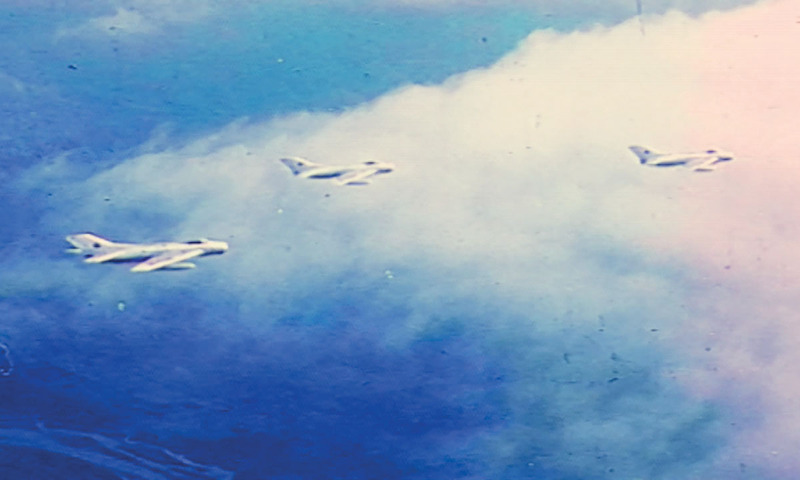 In 1963, after the break in relations with the USSR, the Albanian navy, in a paranoid fear of enemy attacks, sighted an object that repeatedly appeared and disappeared at the surface of the sea off the coast at Patok. 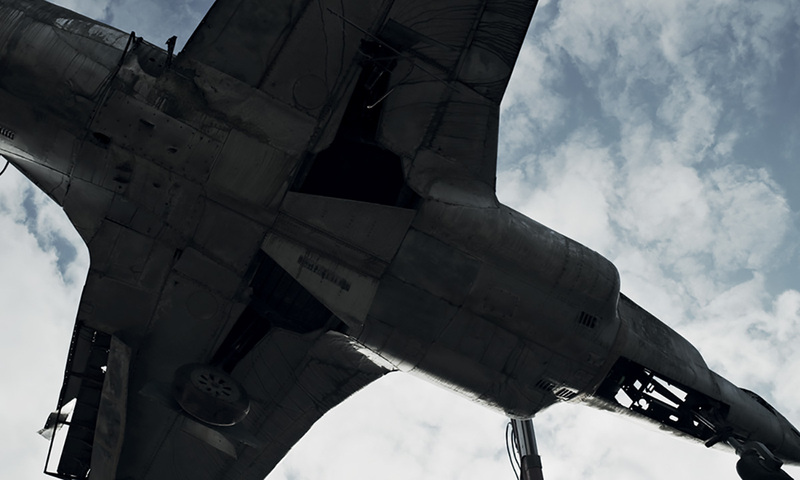 Believing it to be a submarine, they shot it. 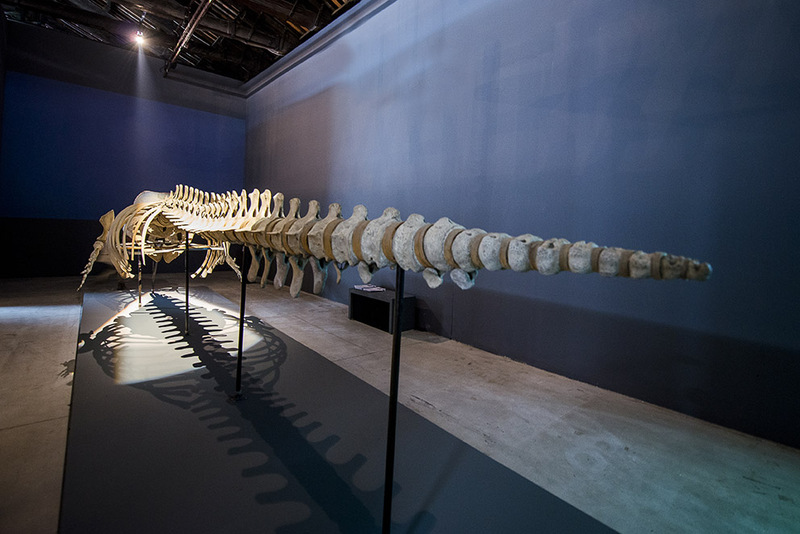 The object turned out to be a cachalot (Physeter macrocephalus), the Mediterranean sperm whale. 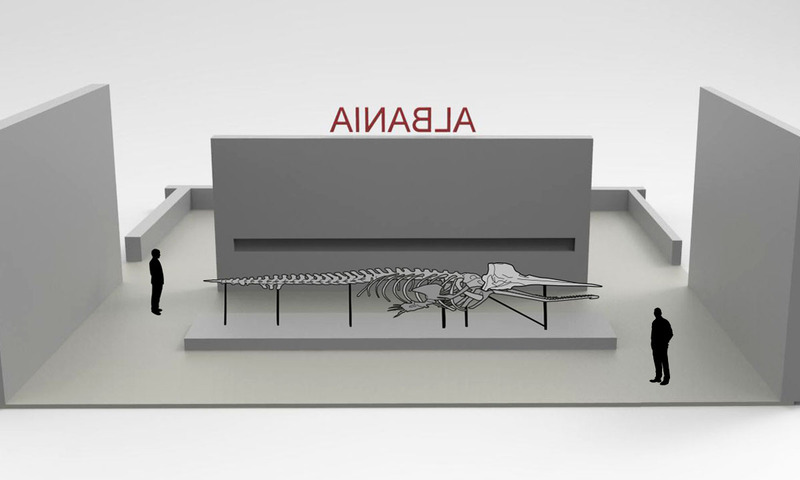 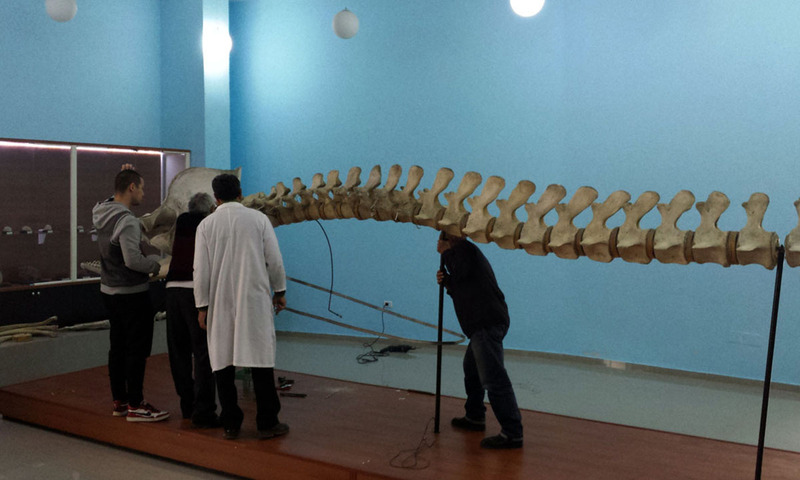 After being recovered, the whale's remains were displayed in the Museum of Natural History in Tirana. 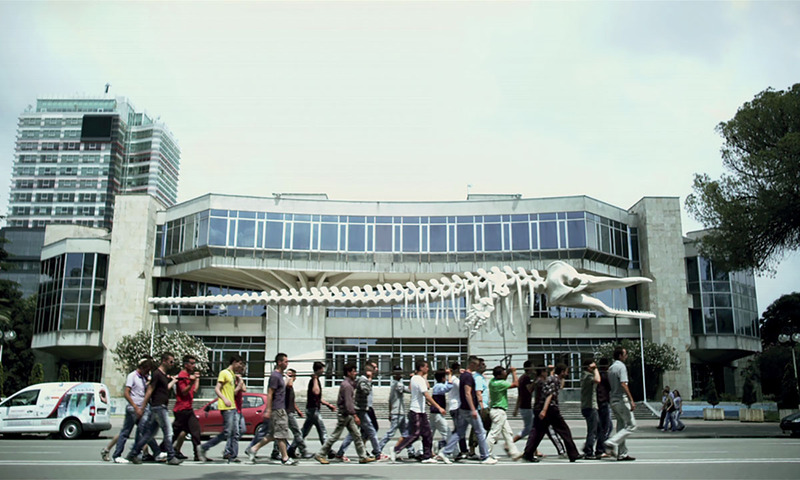 In 2011, the skeleton of the whale reappears in the streets of Tirana, raised onto the shoulders of a group of people, like a ghost wondering around the streets of the city until it found its final resting place inside Enver Hoxha’s mausoleum in Tirana, also known as "Piramida," a pyramid-shaped structure completed in 1987, which was designed by the daughter and son-in-law of the late Albanian communist to glorify his figure and create an eternal monument to him, like the pyramids of the Egyptian pharaohs. 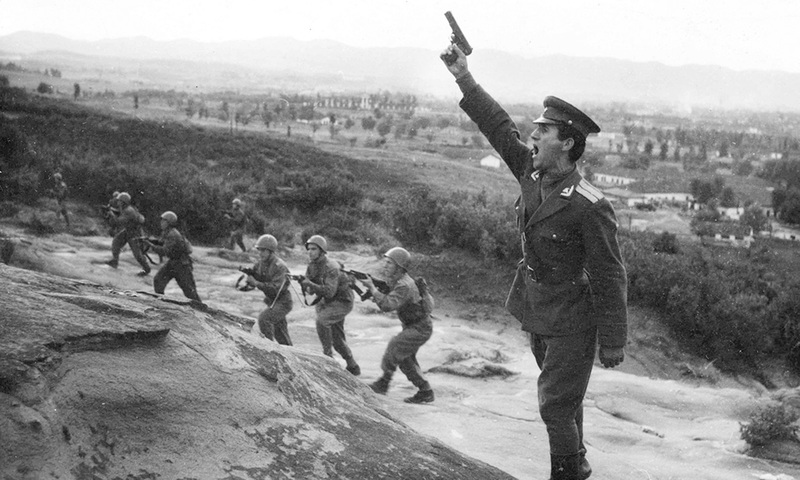 In 1968, at the height of the Cultural Revolution when relations between China and Albania reached their zenith, the Albanian Labor Party undertook an overtly ambitious initiative to celebrate the magnificence of their leader, Enver Hoxha. 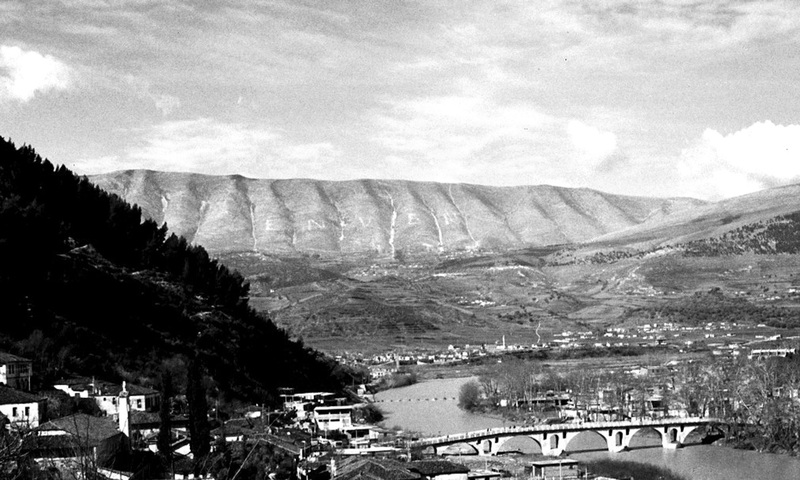 Hundreds of young people were forced to join the Albanian People’s Army in this endeavor, where by means of enormous stones and white paint they spelled out the first name of the dictator on the side of the Shpirag mountain towering over the ancient town of Berat, across a surface area of approximately 36.000 square meters. 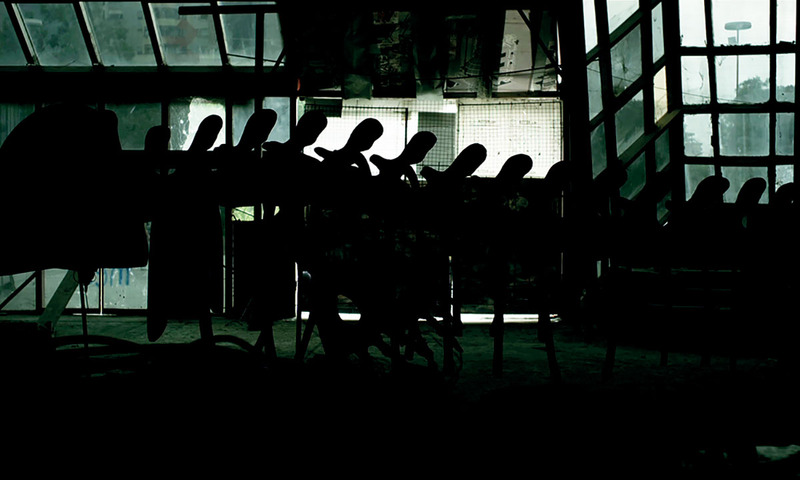 In 1993, after the fall of communism, the Democratic Party took power. 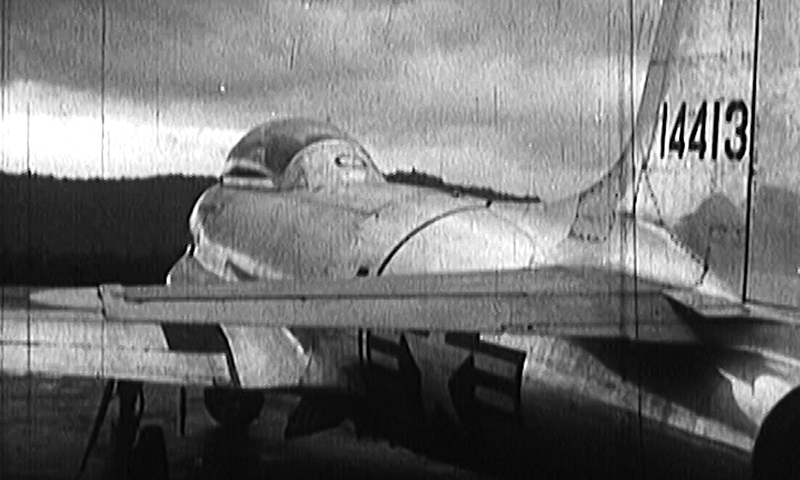 At their orders, the army attempted to destroy the letters using napalm and heavy military equipment. 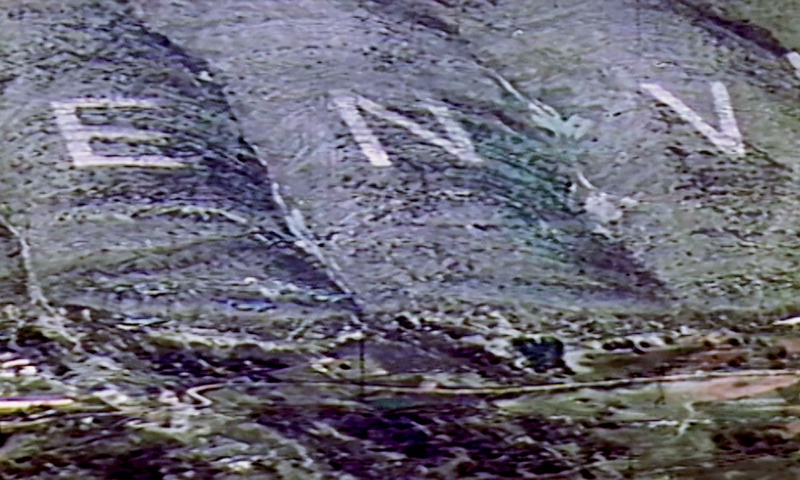 As a result of the explosions, the letters were almost destroyed, while two soldiers were burned alive in process. 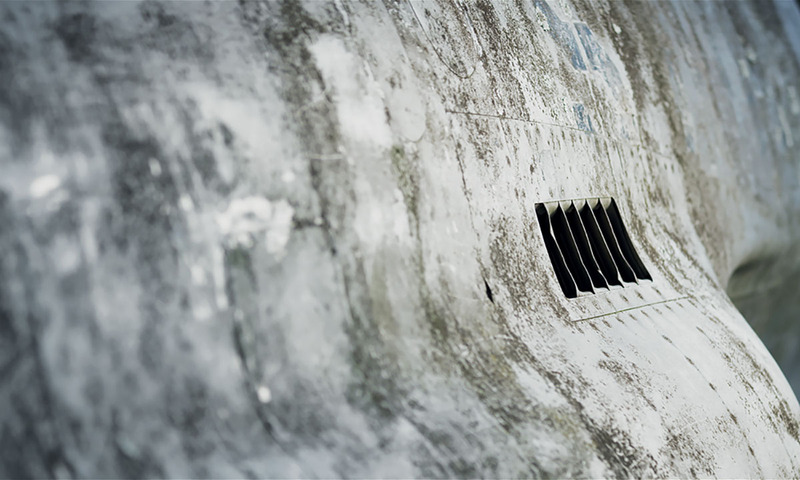 The was broken off, and, with the passing of the time, what could still be seen of the letters became covered in vegetation. 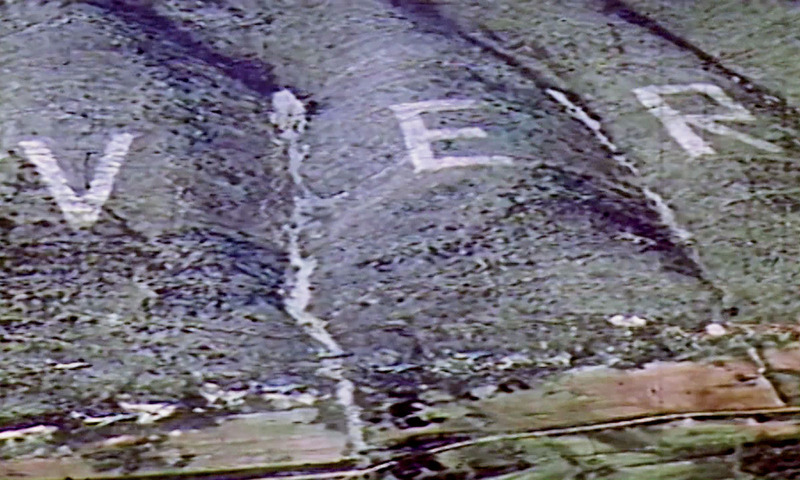 In 2012, the inhabitants of the village return to unearth the letters and rewrite the name. 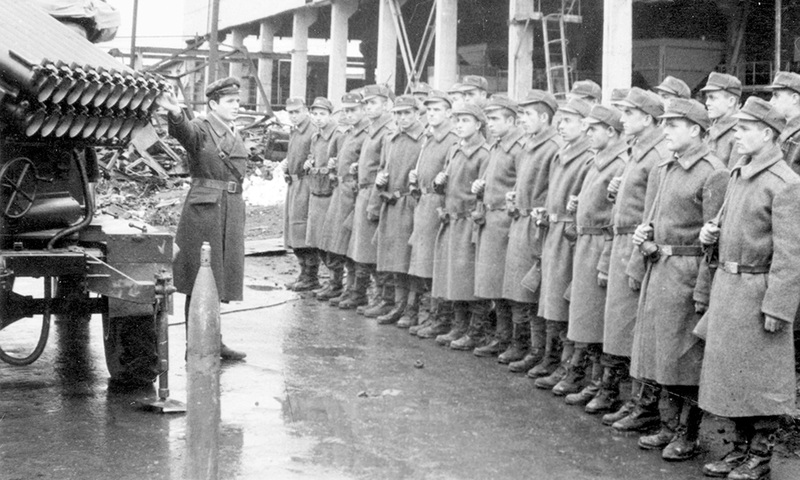 After repeated acts of cleaning, uncovering, and painting, what materializes is however no longer the emblem ENVER, but something altered, incorrect, erroneous. 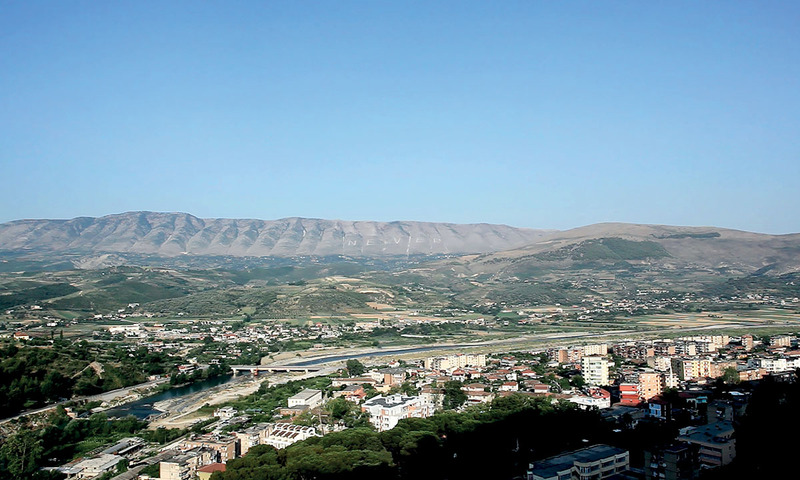 At the moment when the indeterminate becomes the determinate, the Albanian name ENVER returns as the English adverb NEVER. 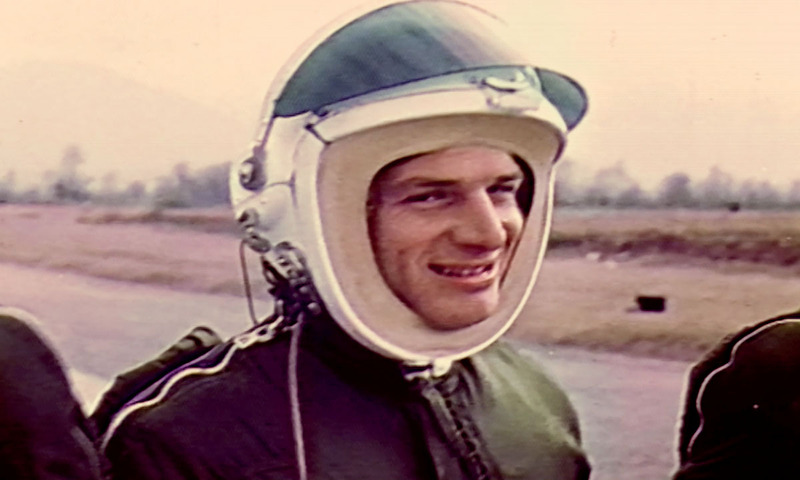 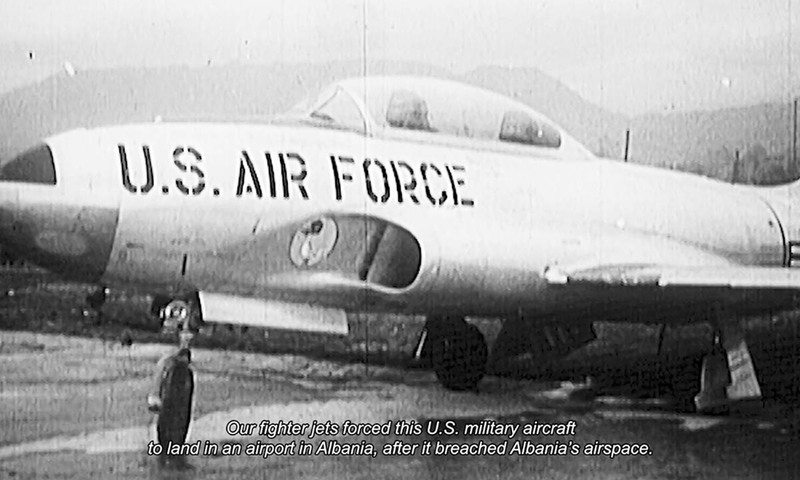 On December 23, 1957, a Lockheed T-33 Shooting Star airplane of the U.S. Air Force entered Albanian airspace. 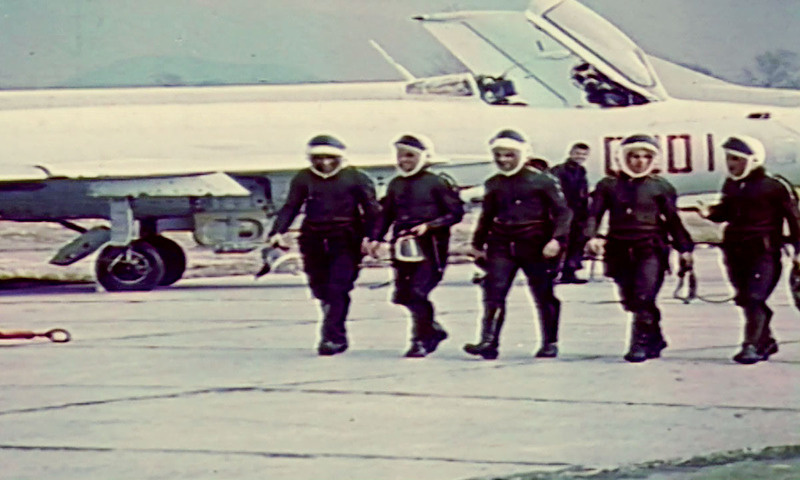 Allegedly, it was swiftly identified by two Albanian MiG-15 fighter jets and subsequently escorted and forced to land at Rinas Airport, which at the time was still under construction. 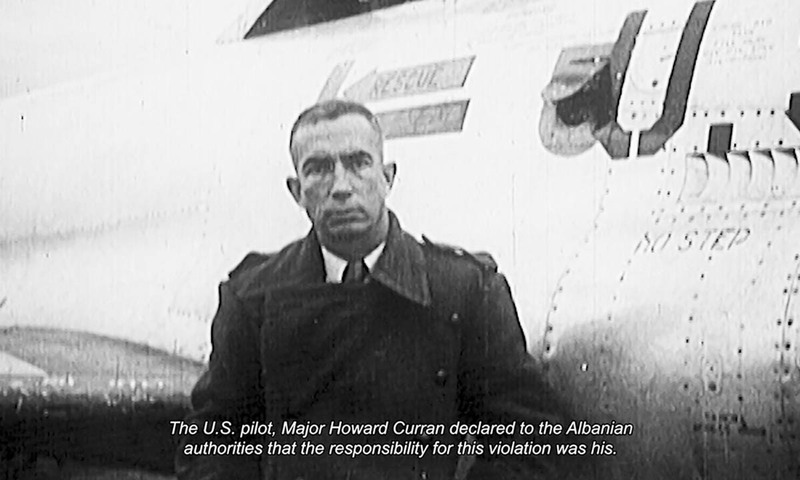 The pilot, Major Howard J. Curran, a WWII hero, was held and interrogated by Albanian officials for over two weeks. 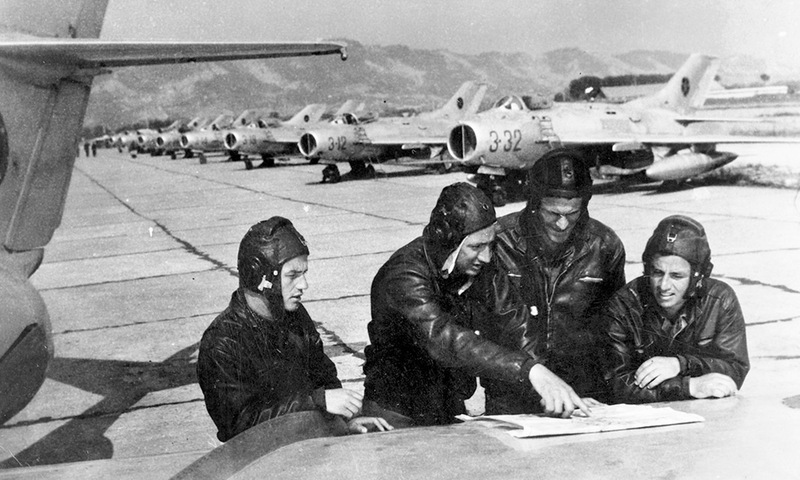 Due to US diplomatic pressure Major Curran was released on January 11, 1958. 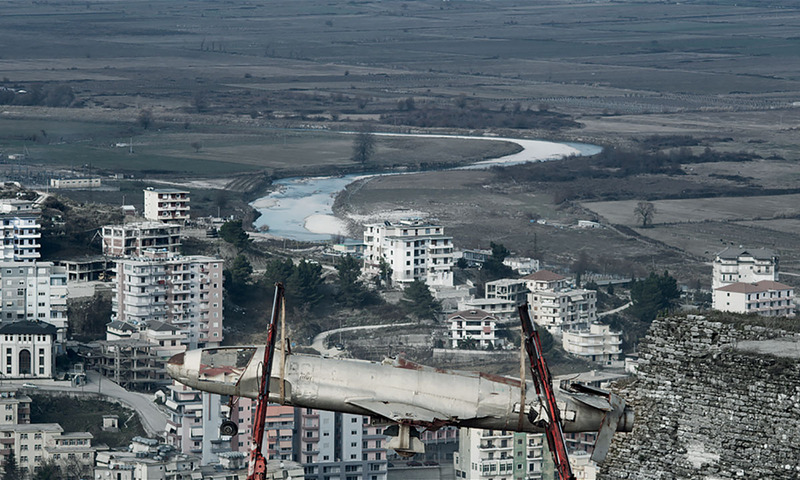 The airplane, however, never left Albania. 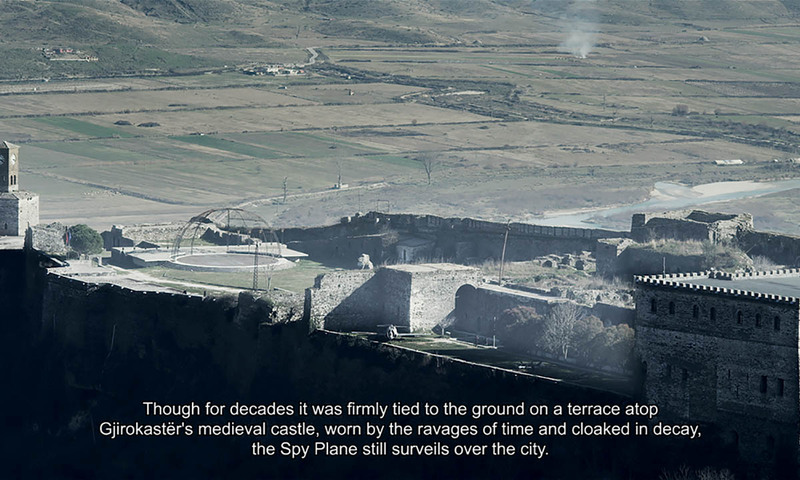 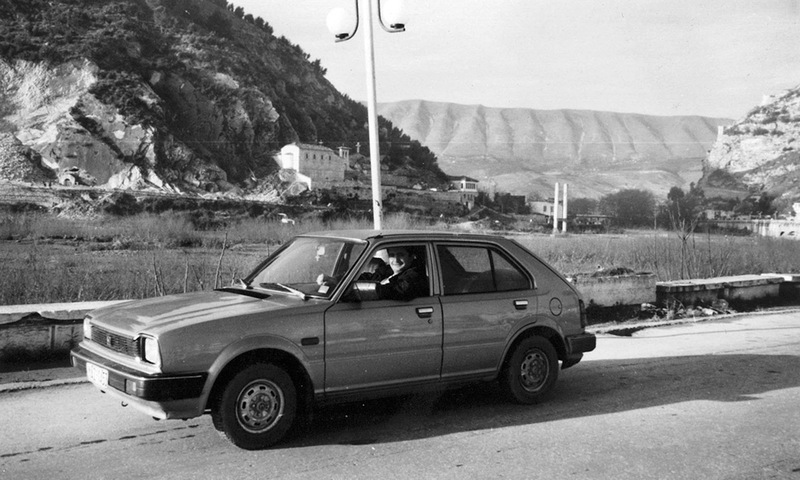 In 1971, on the occasion of the opening of the new Weapons Museum in Gjirokastër, the birth town of the Albanian dictator Enver Hoxha, this symbol of the Cold War found a home on the outskirts of the castle that still hosts the Weapons Museum, with a label that reads “American Spy Plane”. 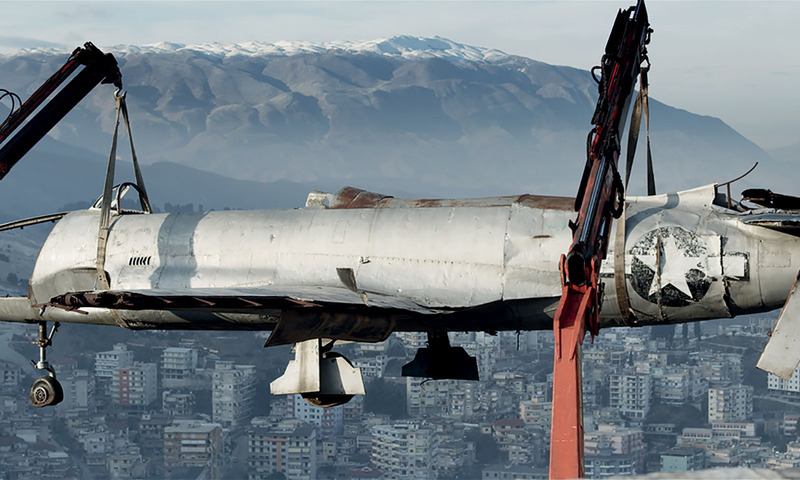 In 2009, the Albanian government wanted to remove the remains of the plane because it was deemed an affront to the now friendly diplomatic relations with the US government. 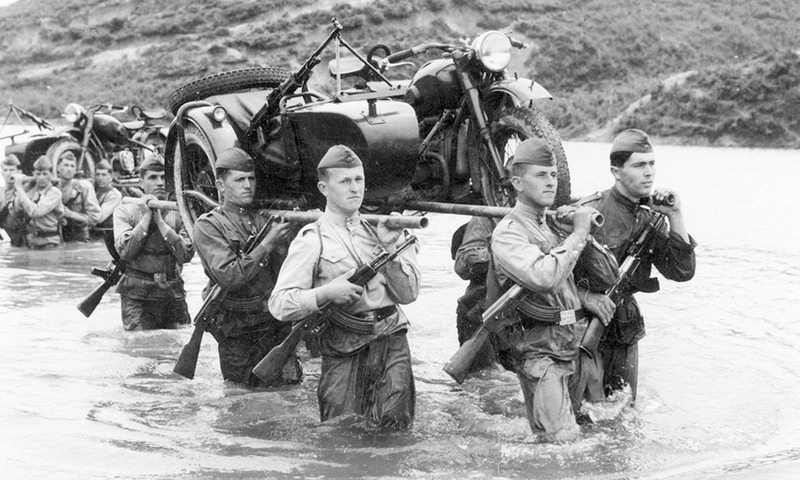 That same year, the former US Ambassador to Albania John L. Withers II, stated that history should not be revised. 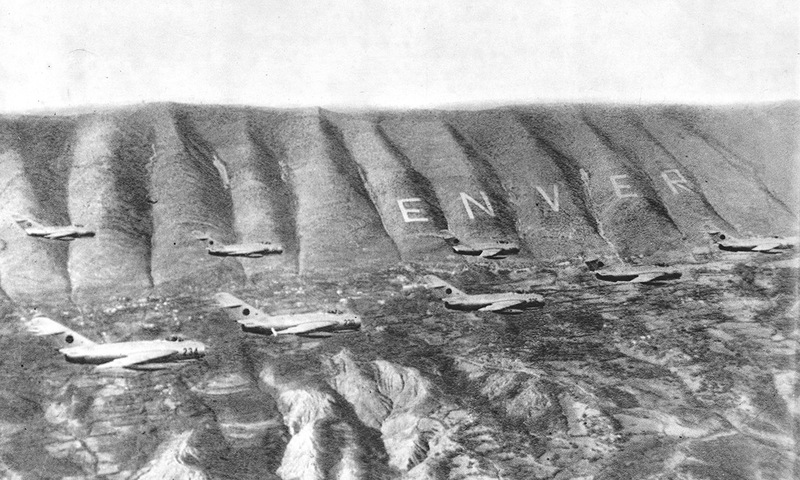 Immediately afterwards, a question mark appeared at the end of the inscription “American Spy Plane,” so that what had been an affirmation turned into a question: “American Spy Plane?”. 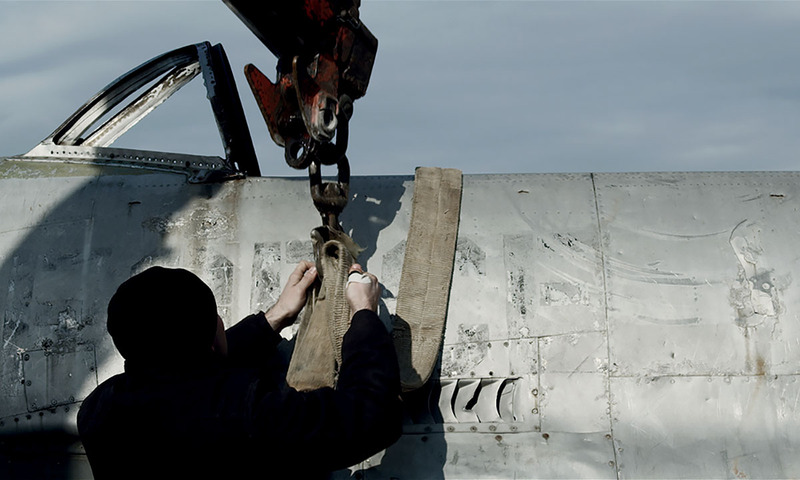 In January 2015, the American plane, ravaged by neglect and the passage of time, will be set free from its confines at the Weapons Museum and the persistent question “Spy Plane?” and once again fly over the skies of Albania. 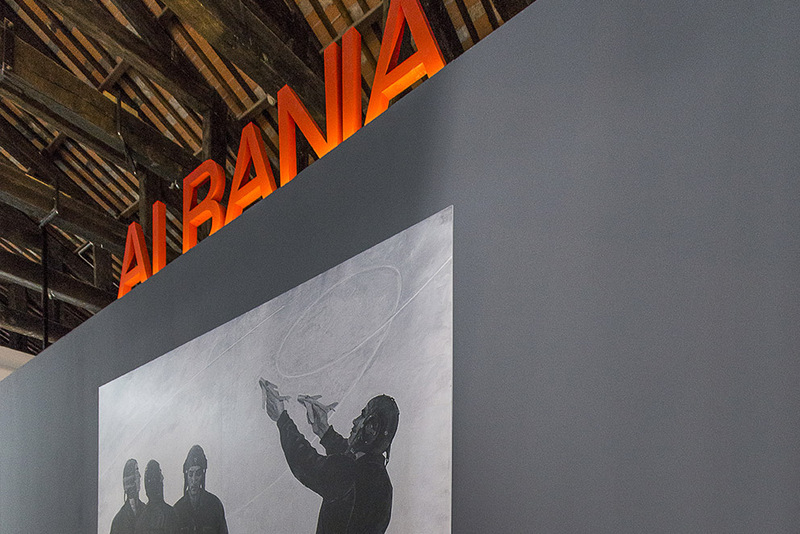 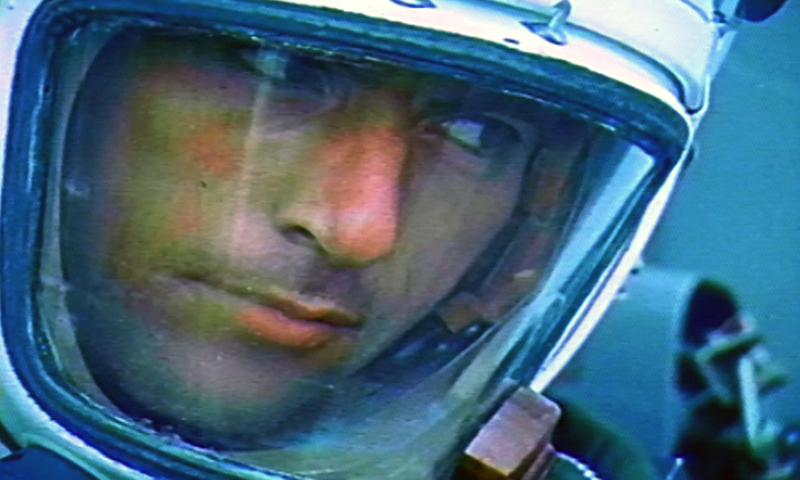 The archival material is seen as an extension of the exhibition and constitute a body of visual and historical record from the period of the Cold War which has contributed to the creation of the Albanian Trilogy films and the Venice pavilion itself. 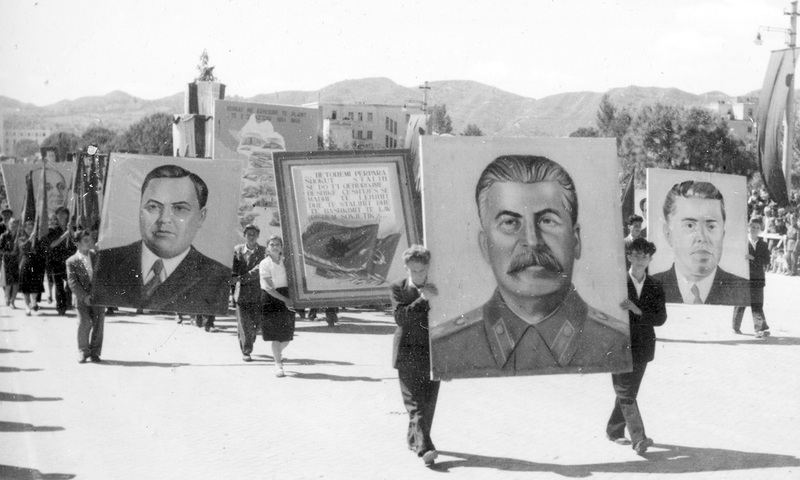 Materials originate from different periods of the history of Albania under leader Enver Hoxha: the Soviet period of "orthodox stalinism" (from 1944), the break with the Soviet Union under Khrushchev (1961) and that of close relations with China, where the paranoia of foreign attacks grew greatly. 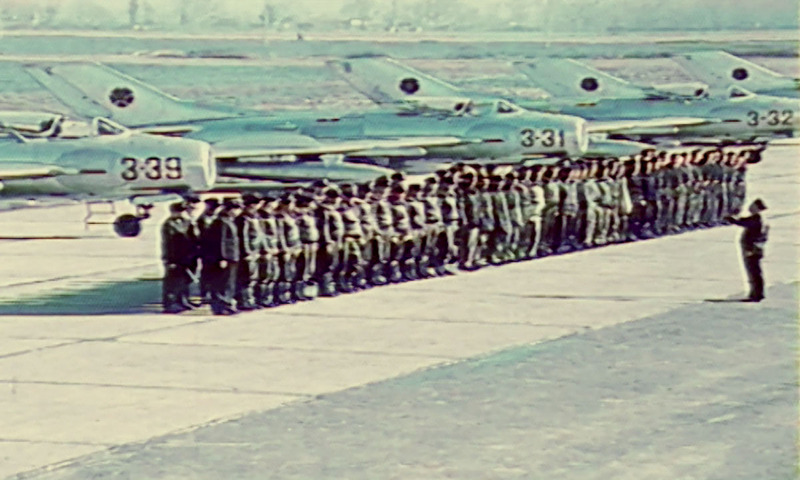 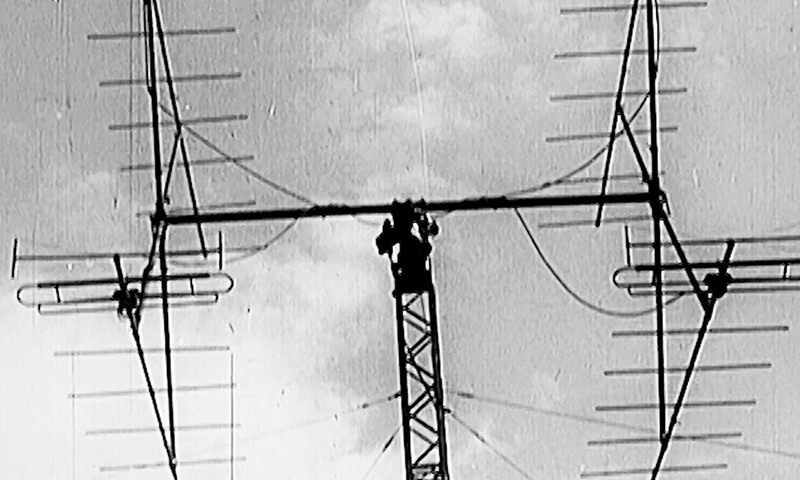 Many of the materials have now been made public for the first time, and come from the following institutions: Archive of the Albanian Telegraphic Agency, Archive of the Ministry of Defense of Albania, Archive of the Ministry of Foreign Affairs of Albania, Archive of the Ministry of interior Affairs of Albania, Central State Archive of Albania, the National Film Archive of Albania. 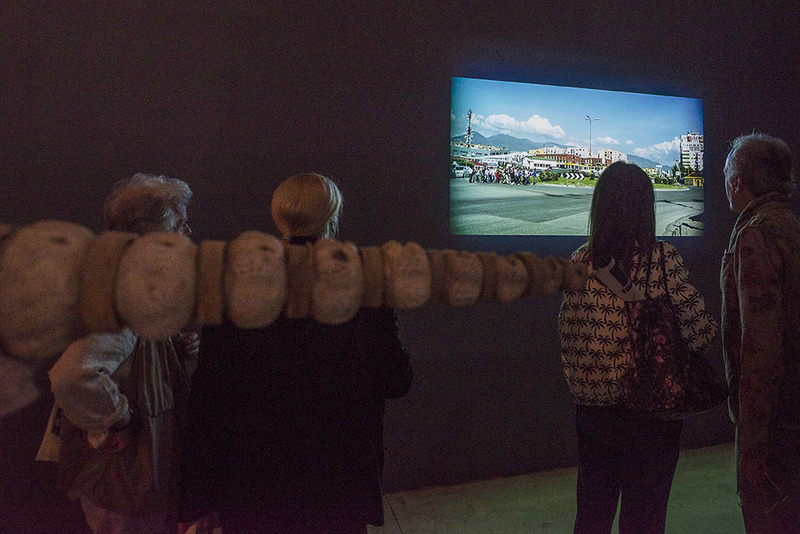 The pavilion’s display wants to maintain the constituent duplicity between the episodes of the past as starting points but also as escape points in their artistic re-enactment in the three films of Albanian Trilogy. 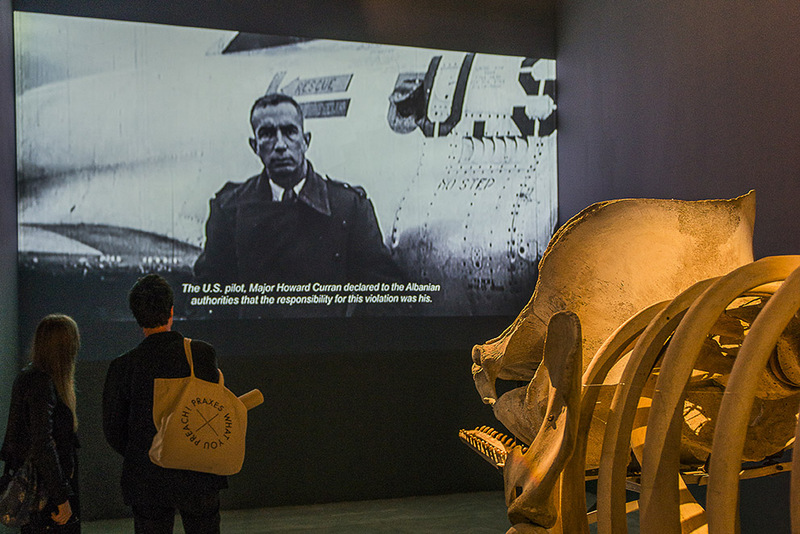 In order to mark out the gap between the past and the present, the exhibition pavilion has been transformed into a double museum: on the one side, exhibits and documents in their original state are set out in a display and, on the other, their return in a different and altered state becomes visible in the cycle of video projections. 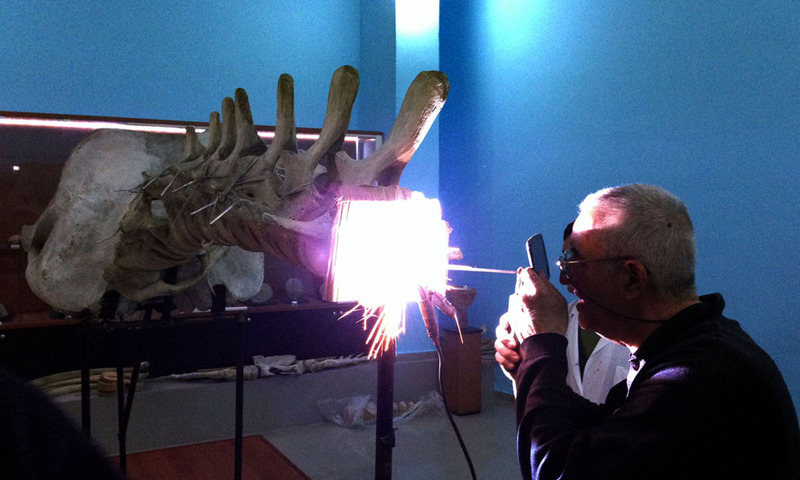 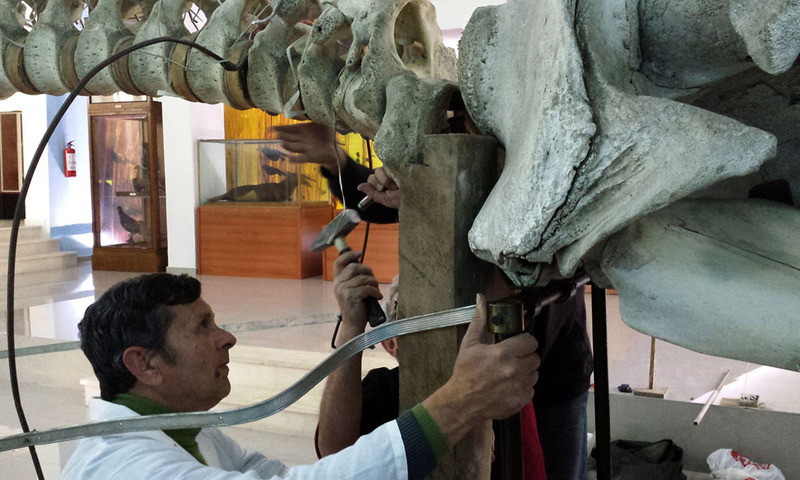 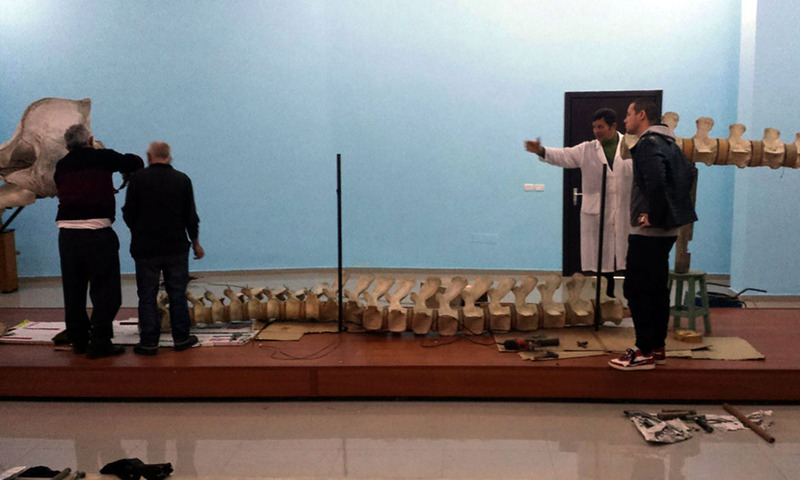 Dismantling of the whale in the Museum of Natural Science in Tirana. 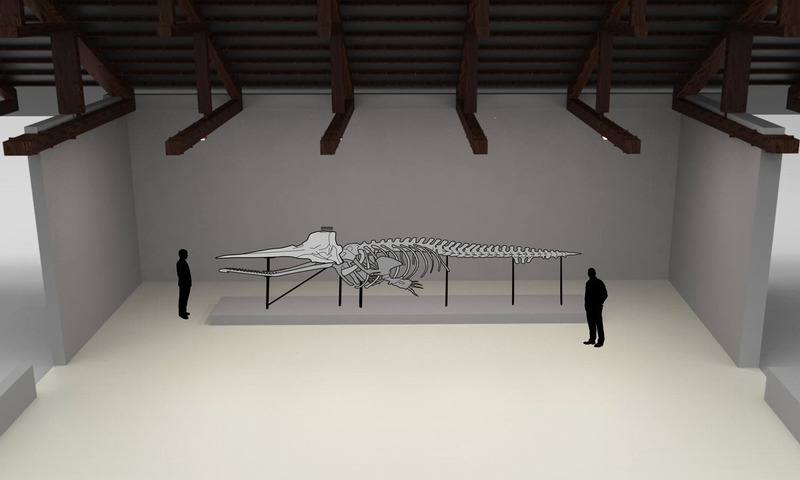 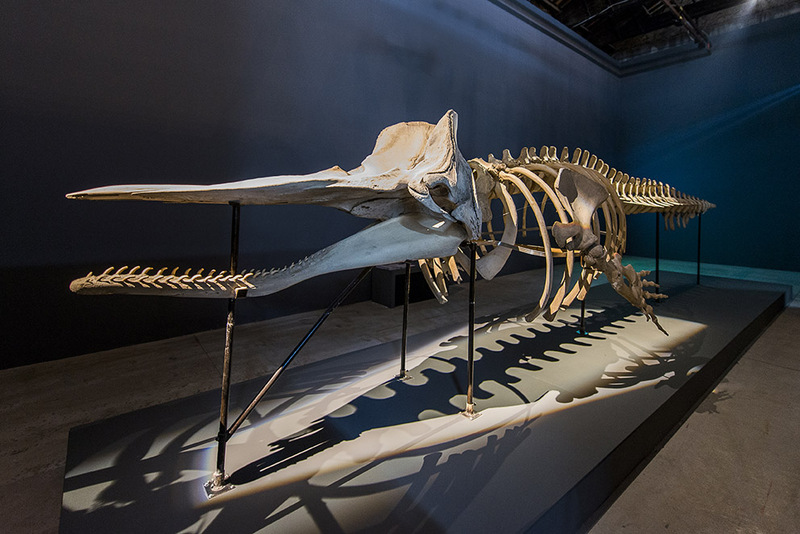 The skeleton of the Cachalot was shot down in 1963, mistaken for an enemy submarine, and has now traveled from Tirana to Venice across the sea to be placed within the "time-capsule" of the Albanian Pavilion in Arsenale, in which is positioned as the phenomenization of the enemy. 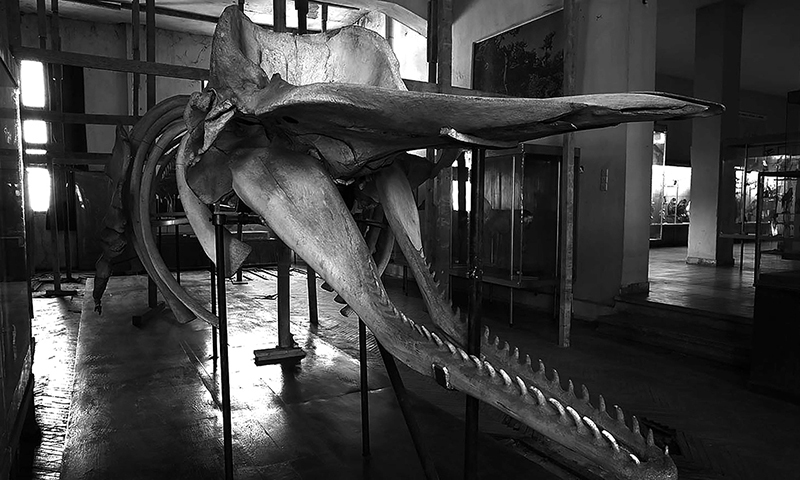 The whale represent also the figure of the Hobbesian Leviathan, the principle of sovereignity. 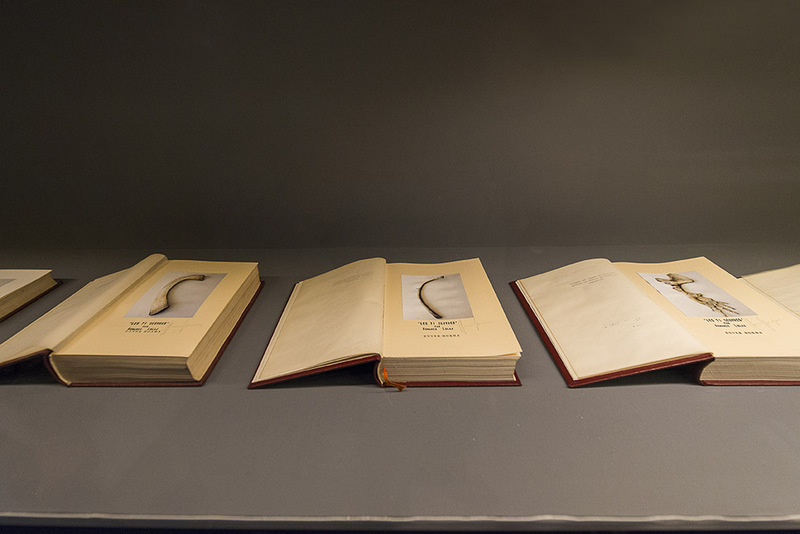 The photographs of his single vertebrae will replace the portraits of the leader Enver Hoxha in Les 71 Oeuvres, the new work by Armando Lulaj who intervened on the 71 books that the leader has written and rewritten until the end of his life. 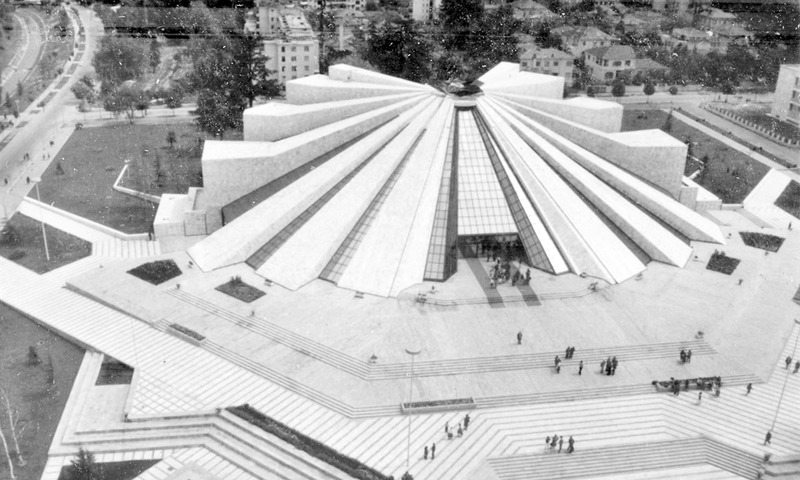 Luigi D'Oro architect & Arguzia s.r.l.